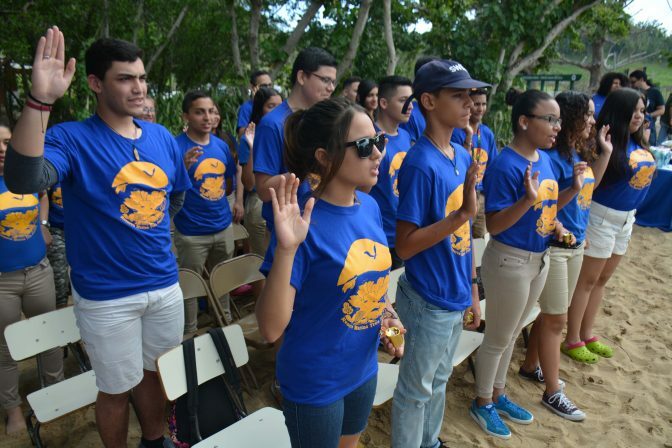 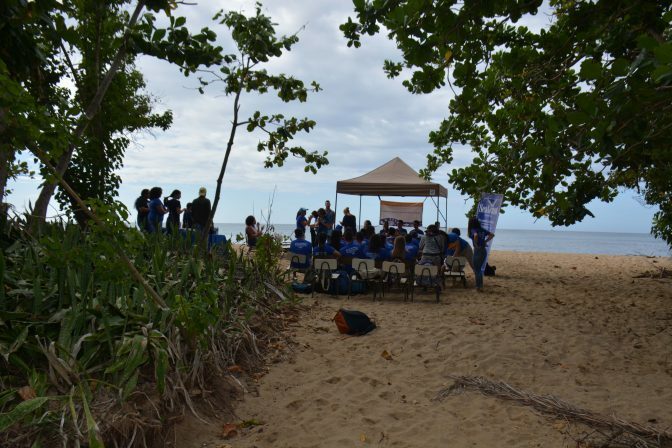 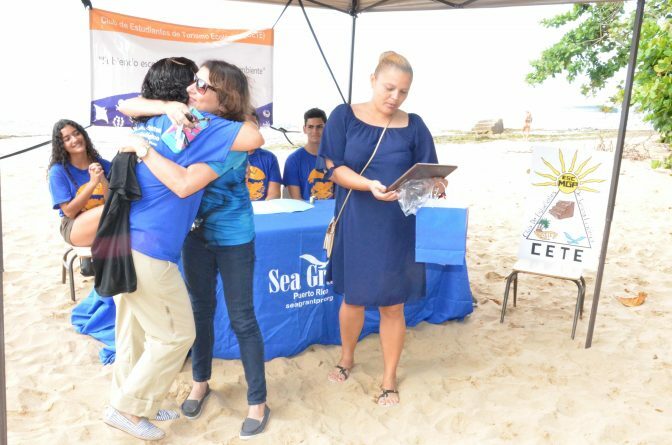 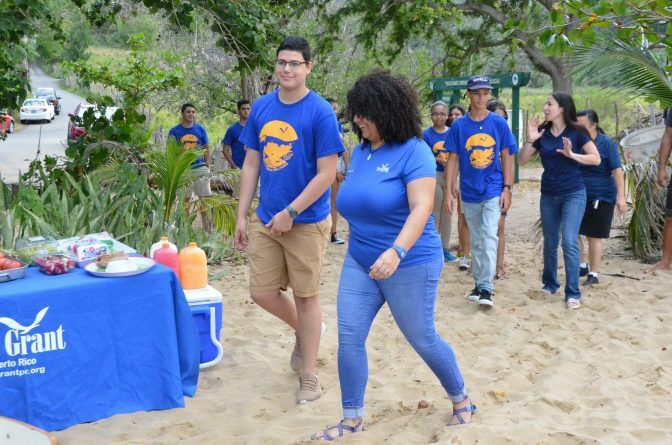 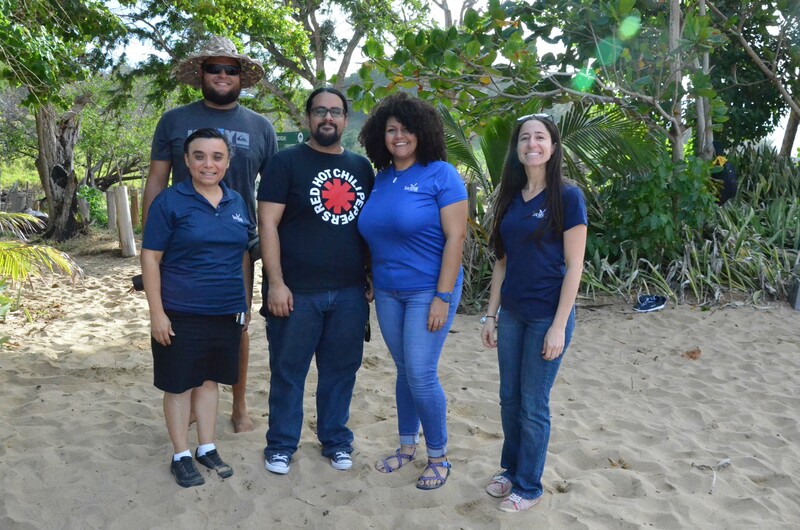 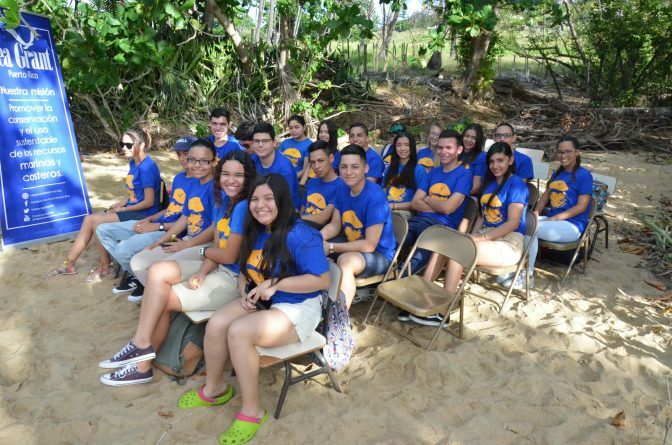 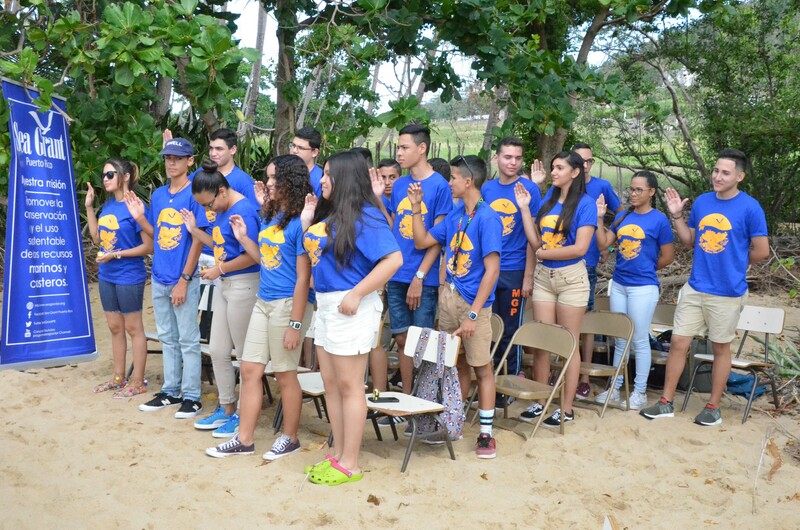 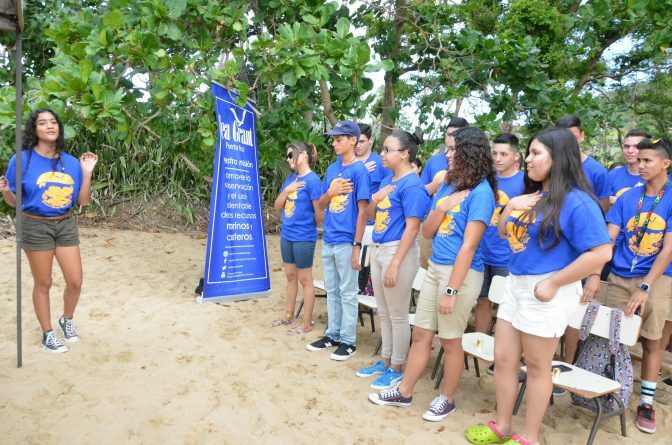 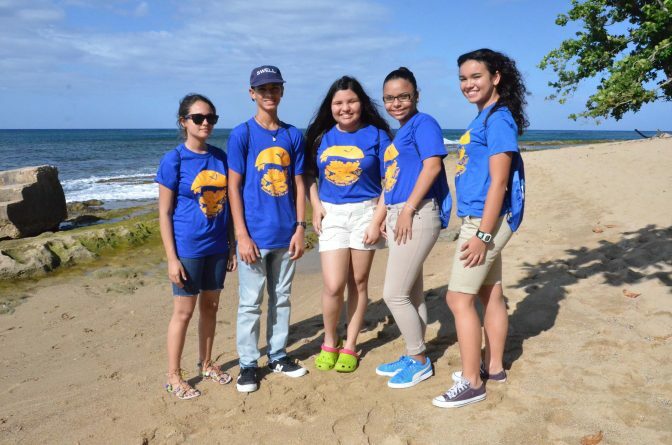 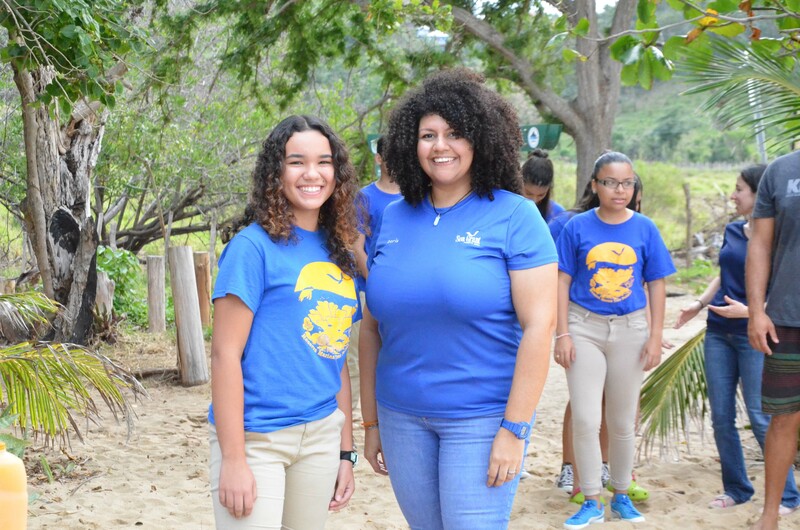 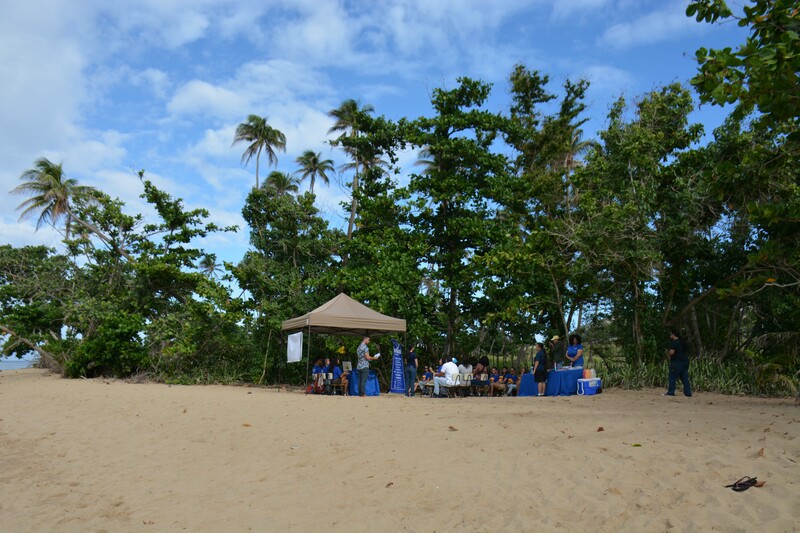 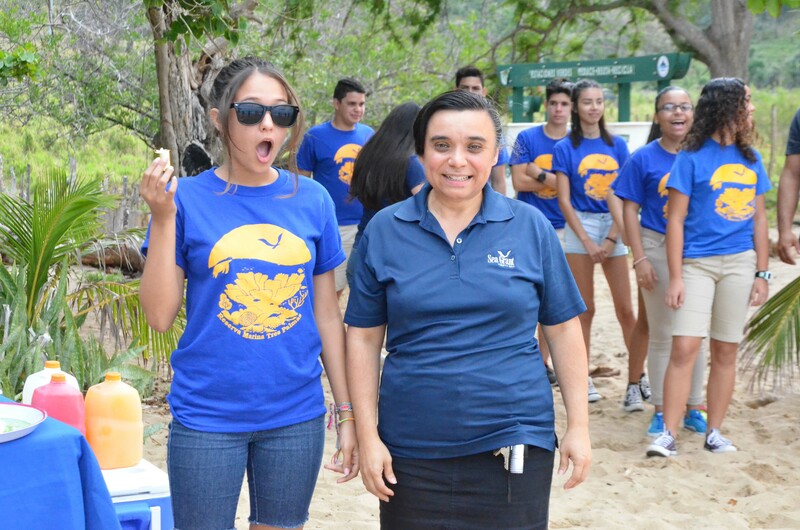 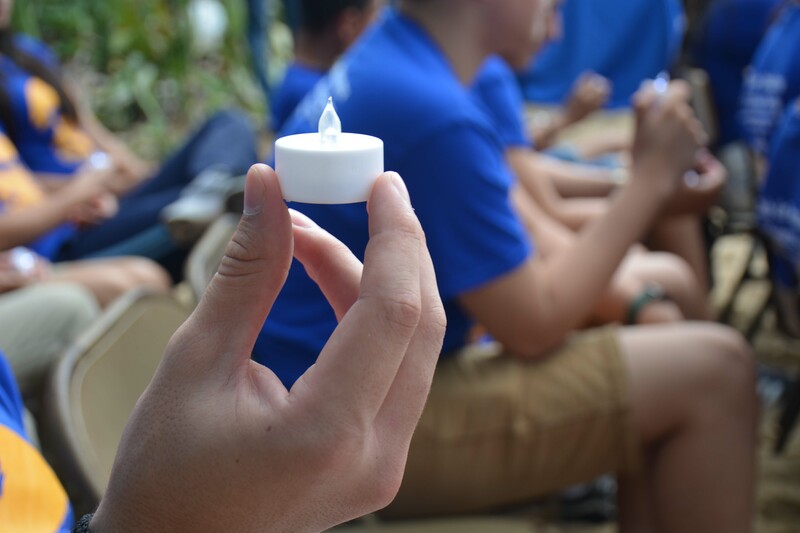 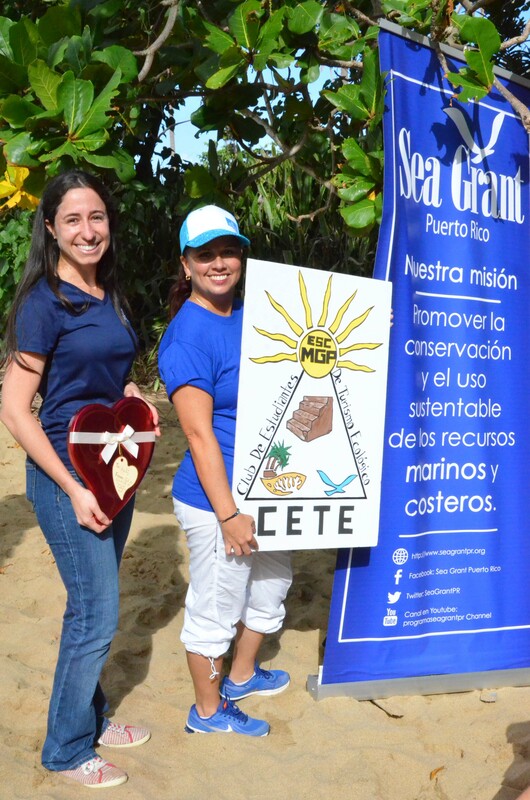 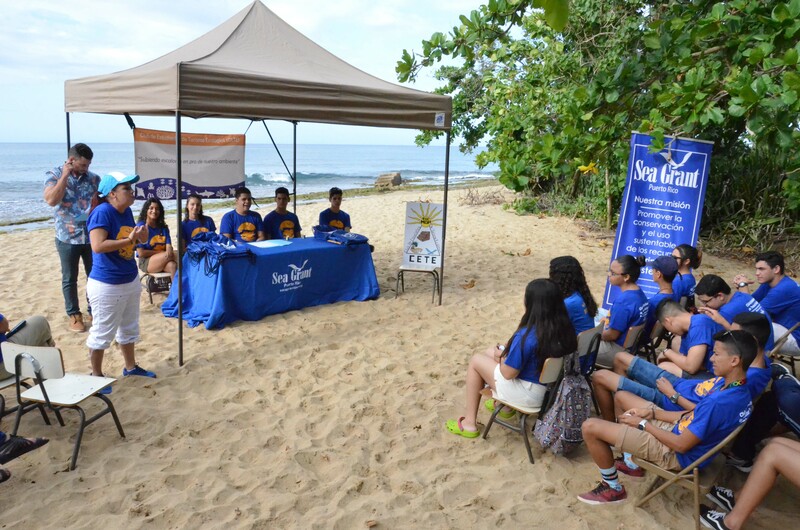 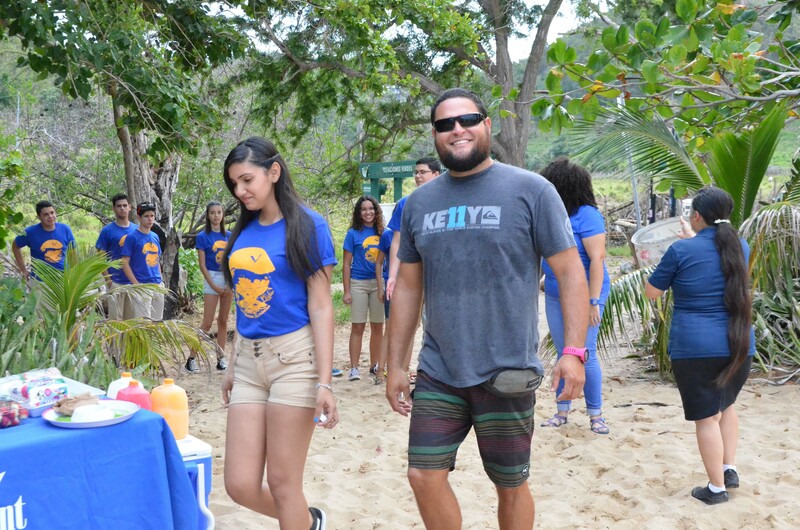 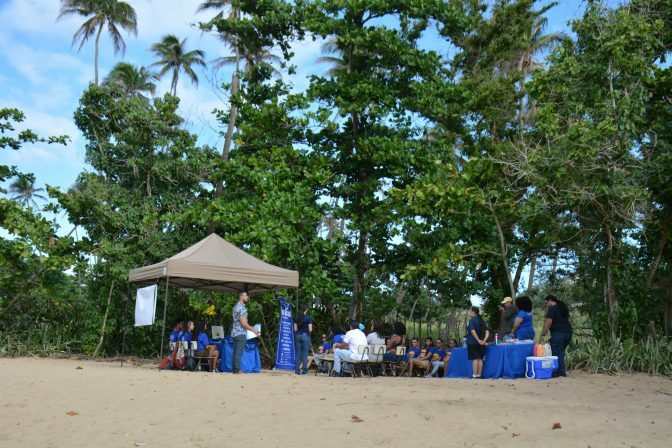 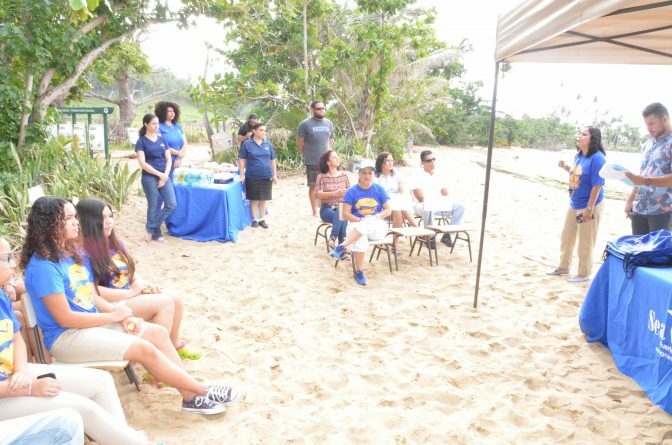 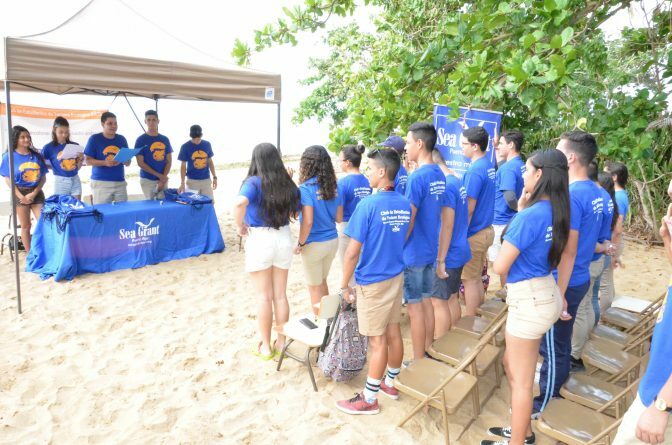 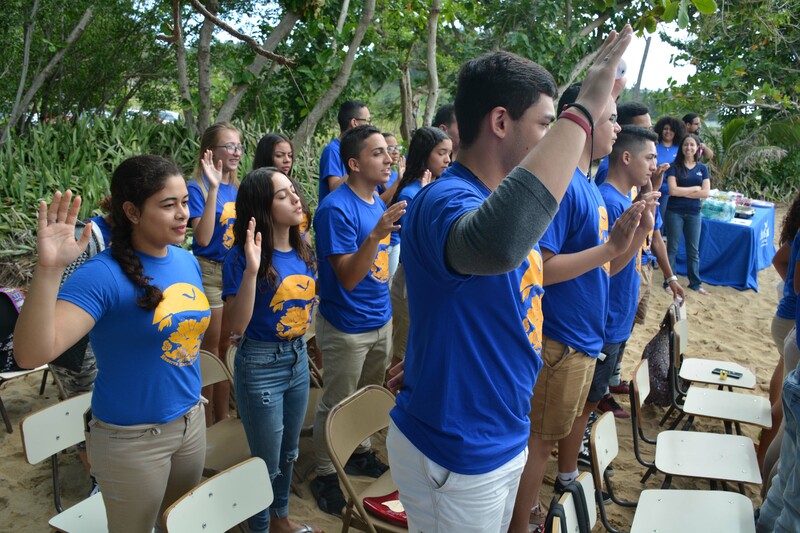 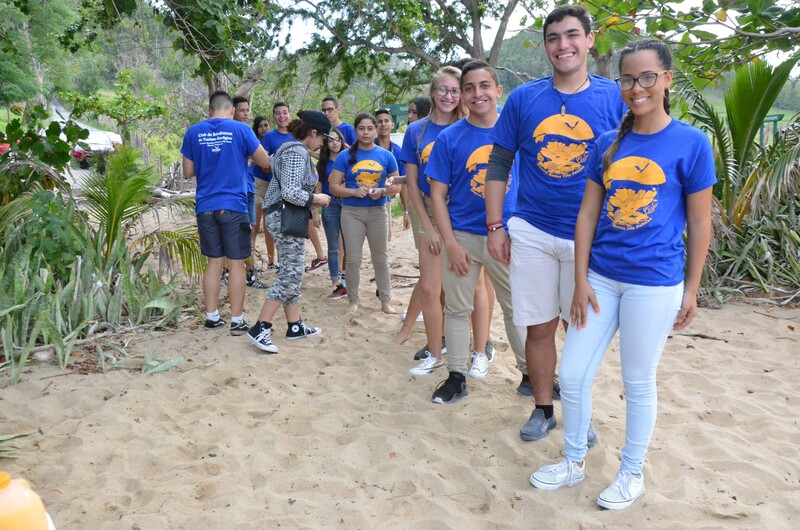 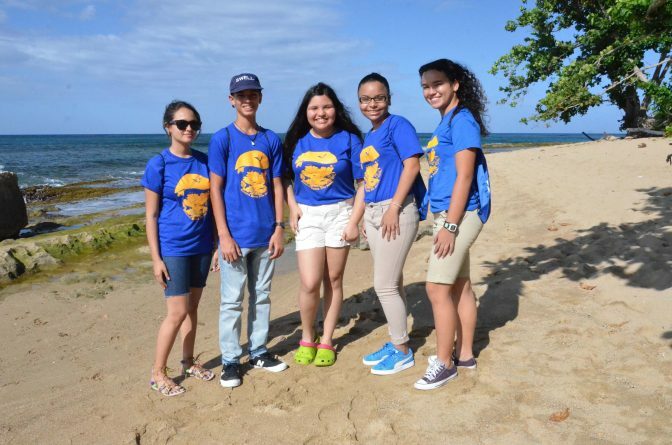 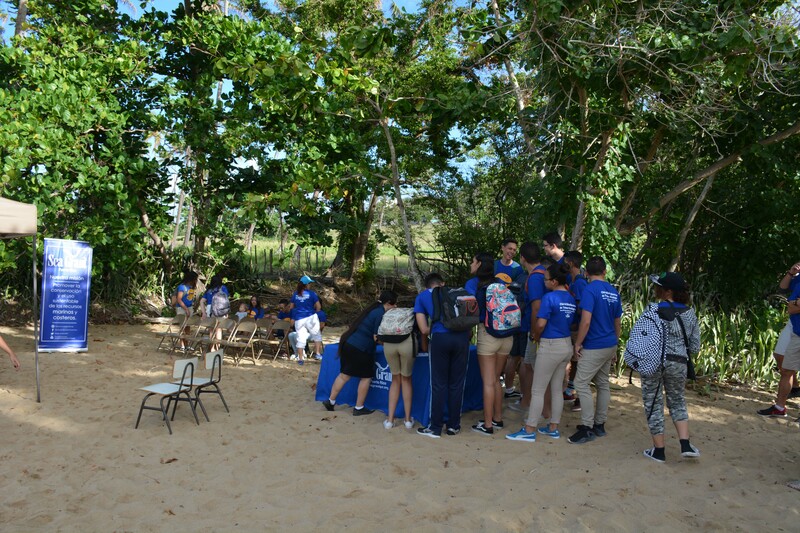 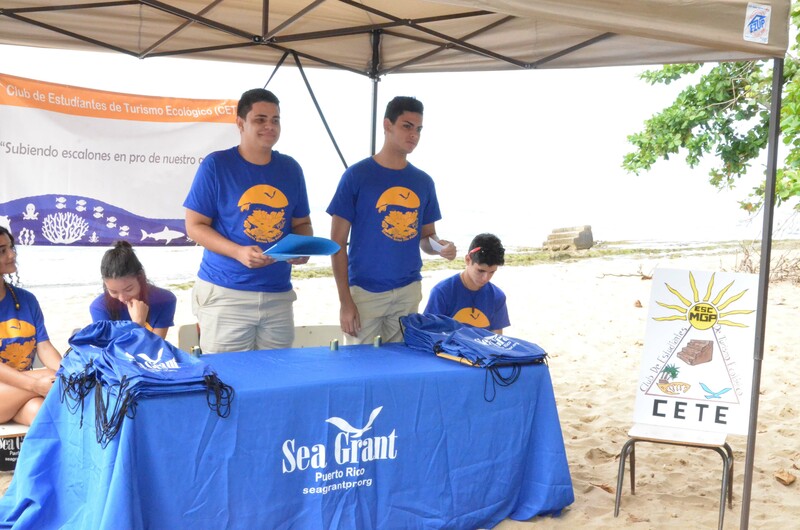 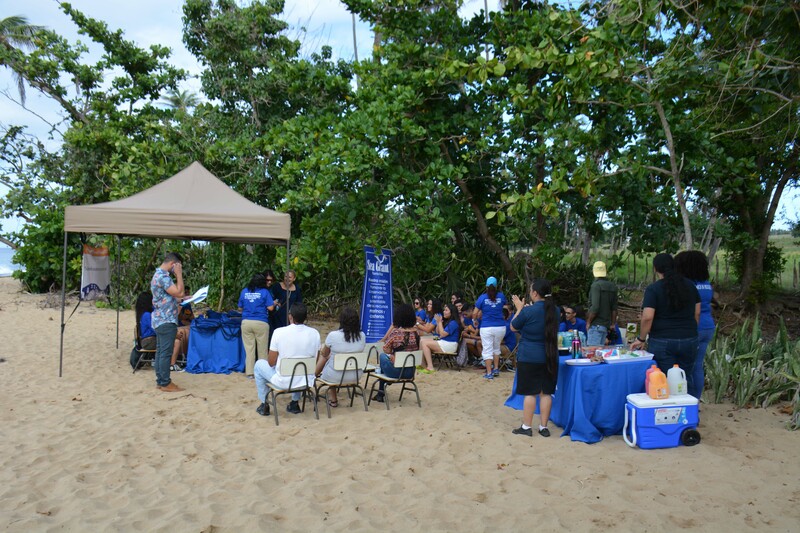 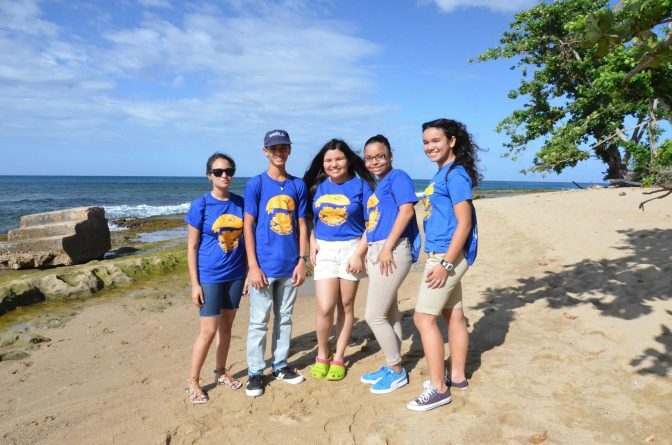 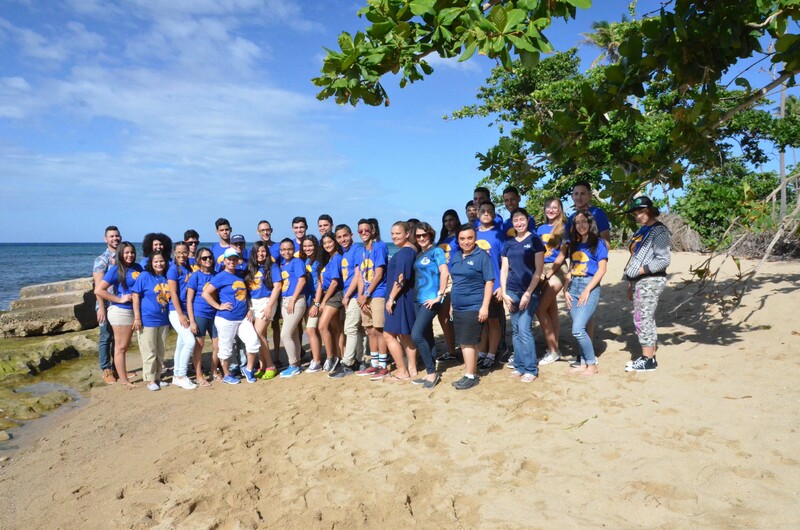 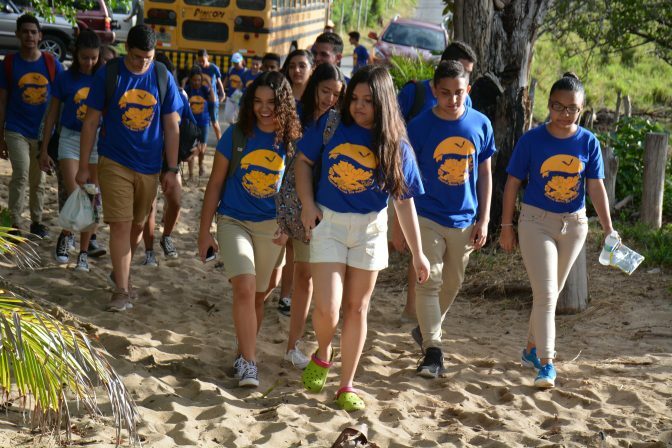 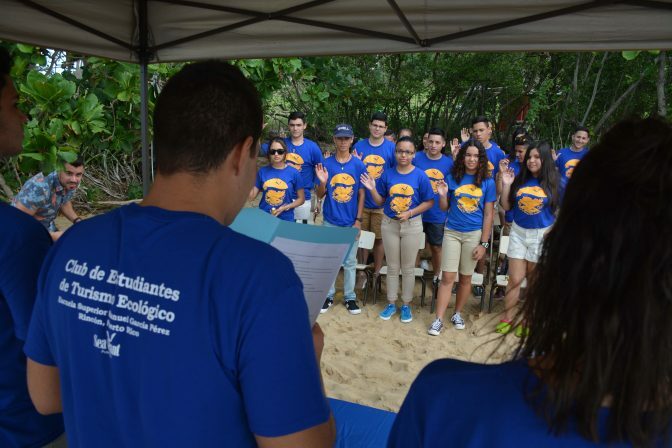 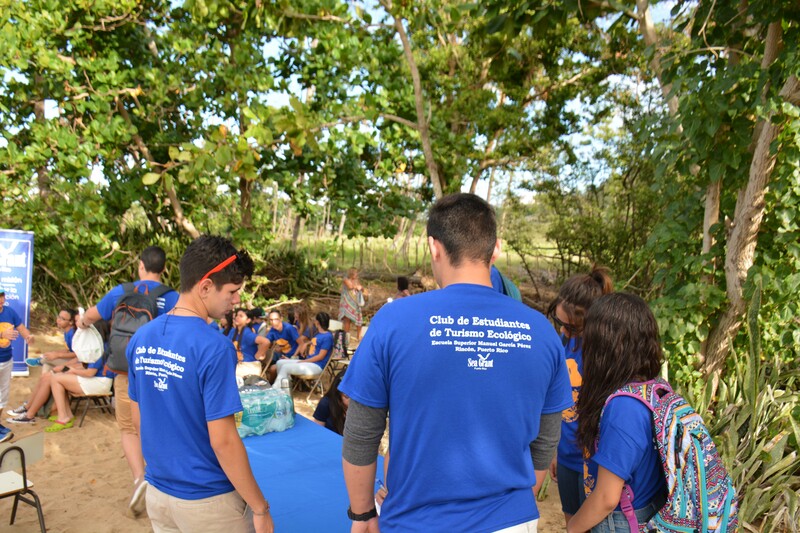 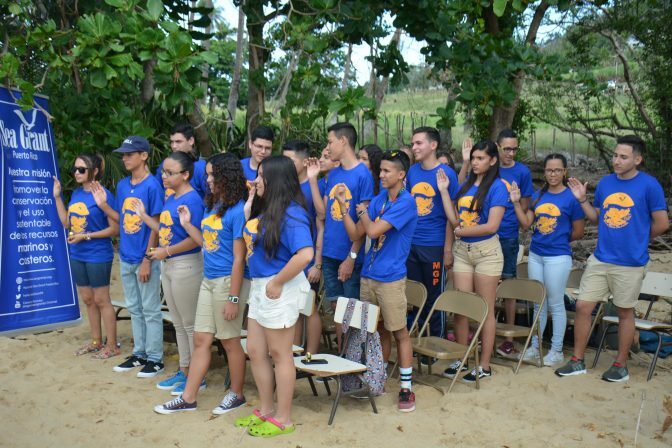 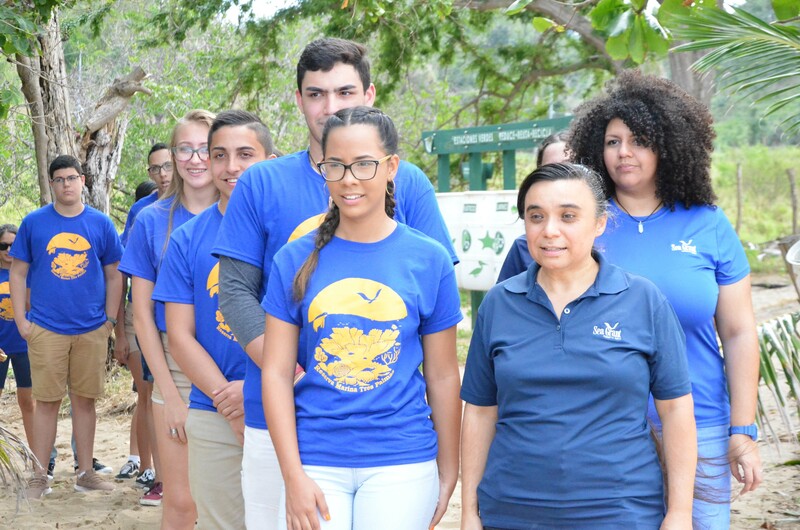 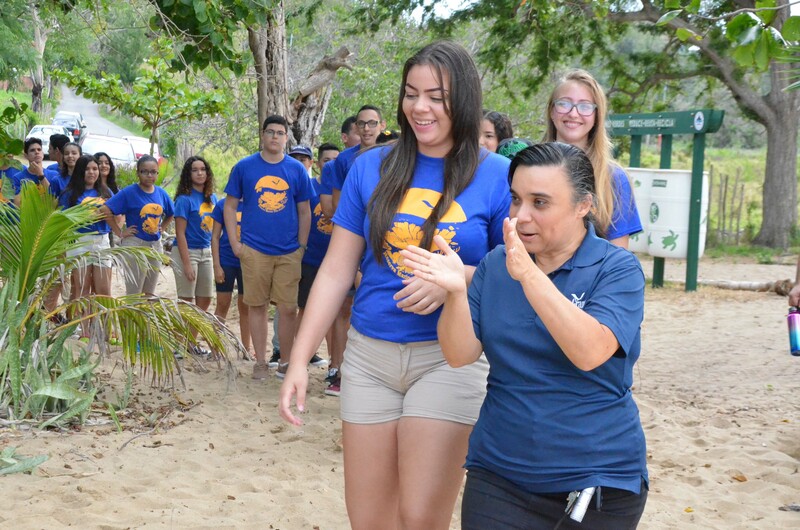 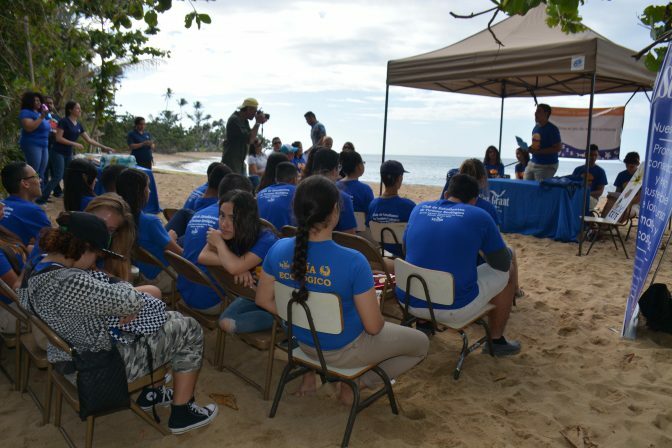 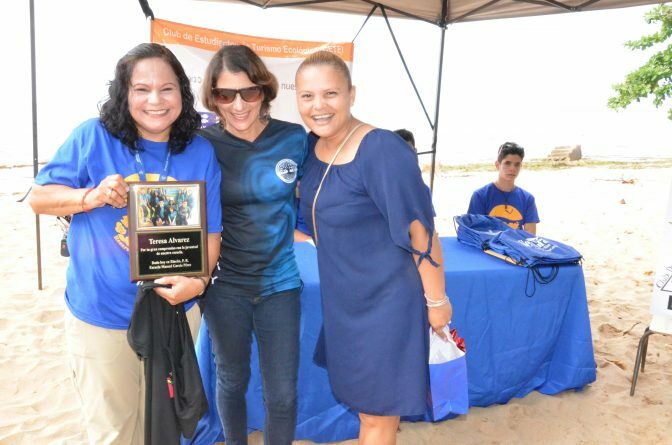 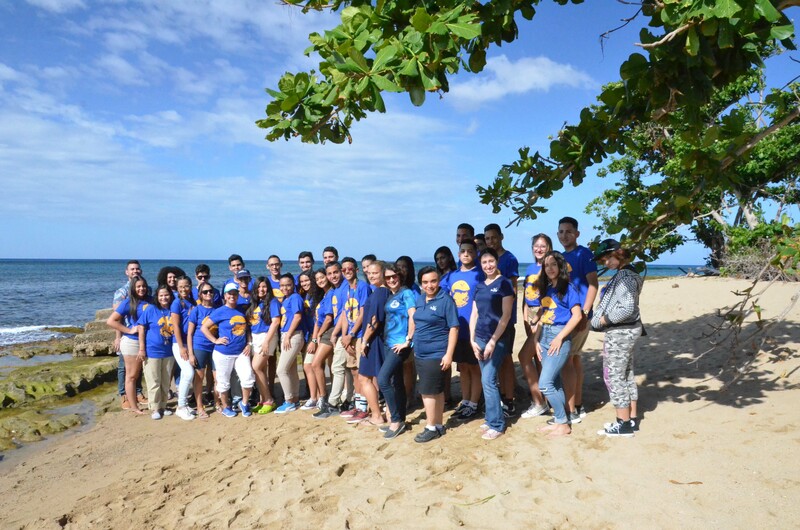 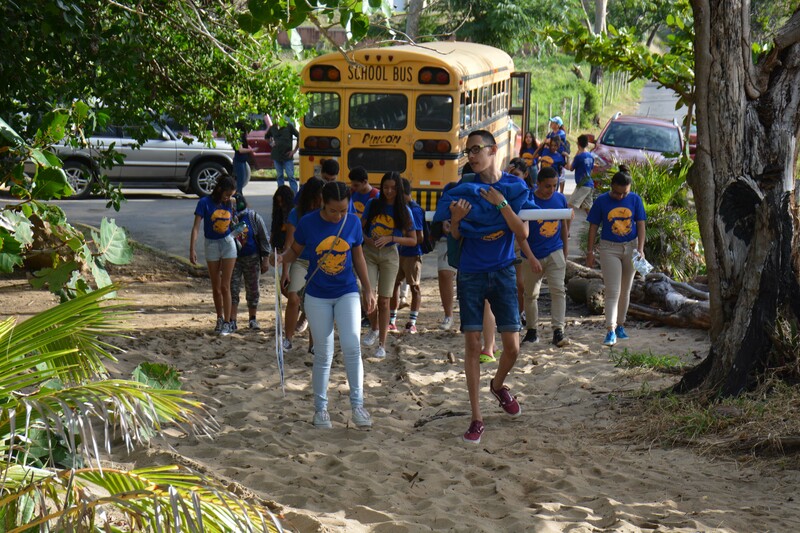 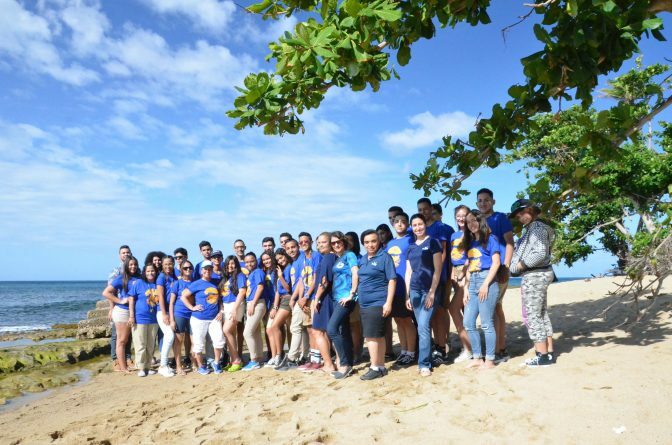 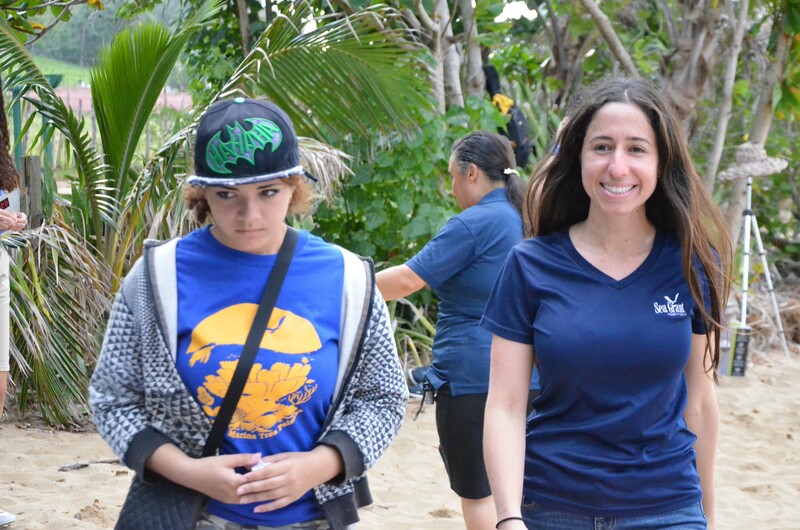 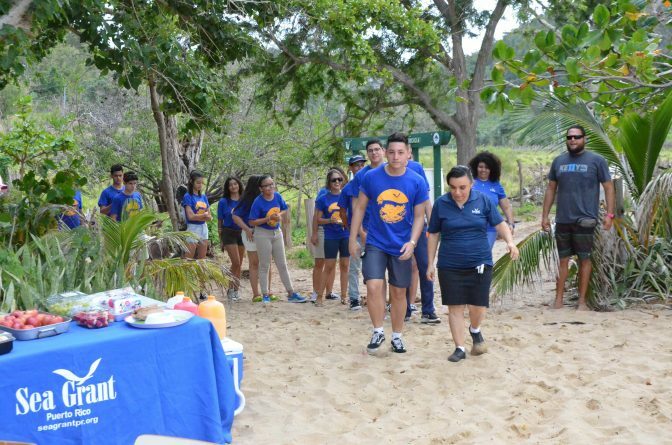 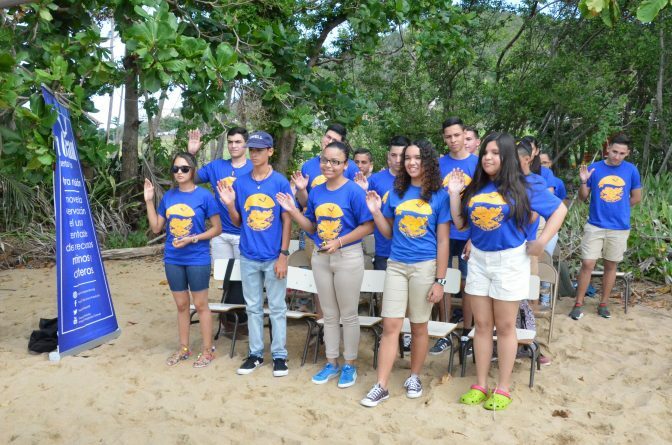 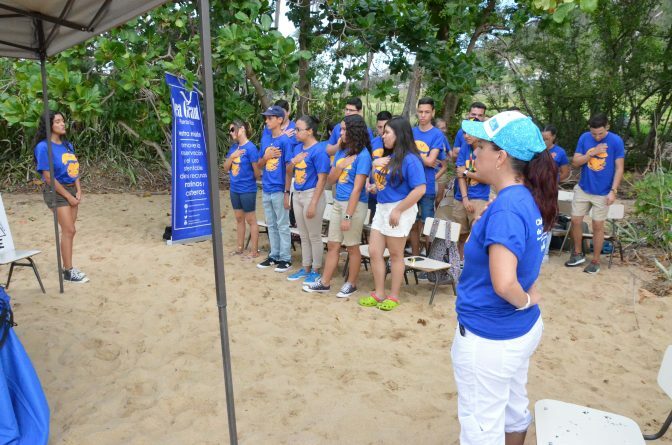 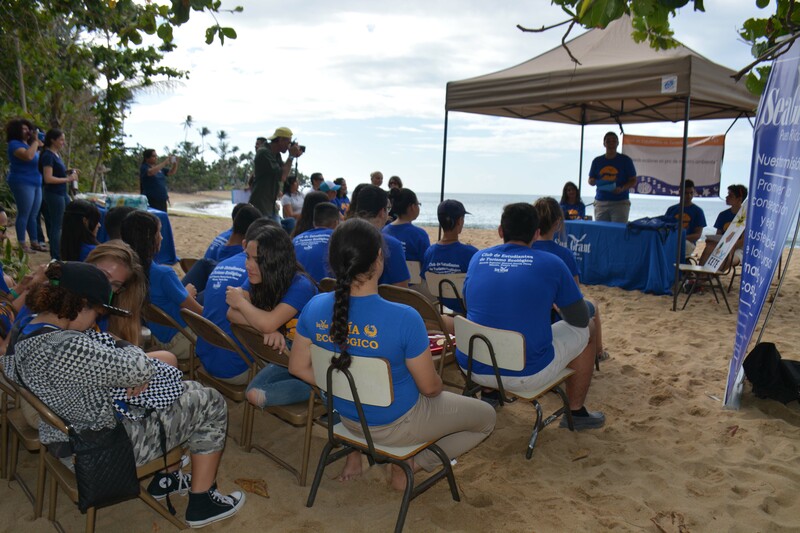 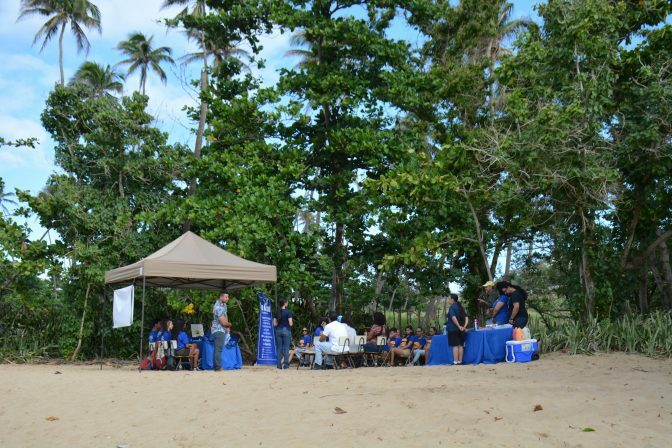 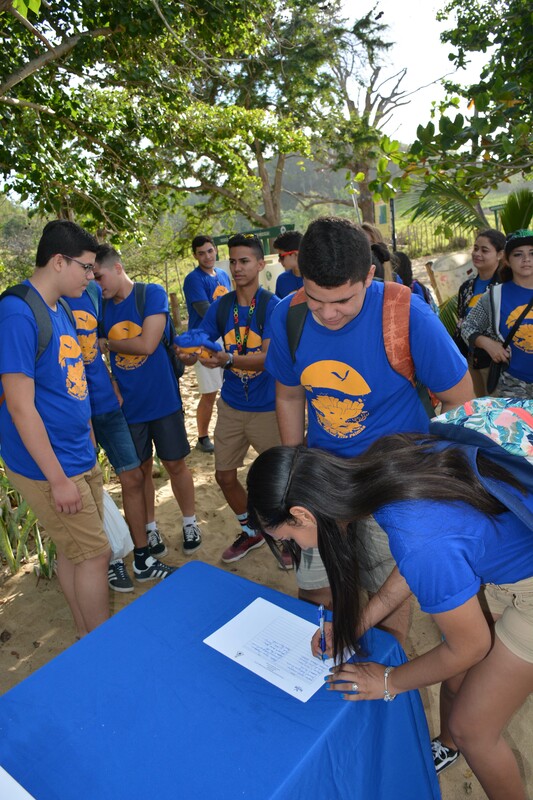 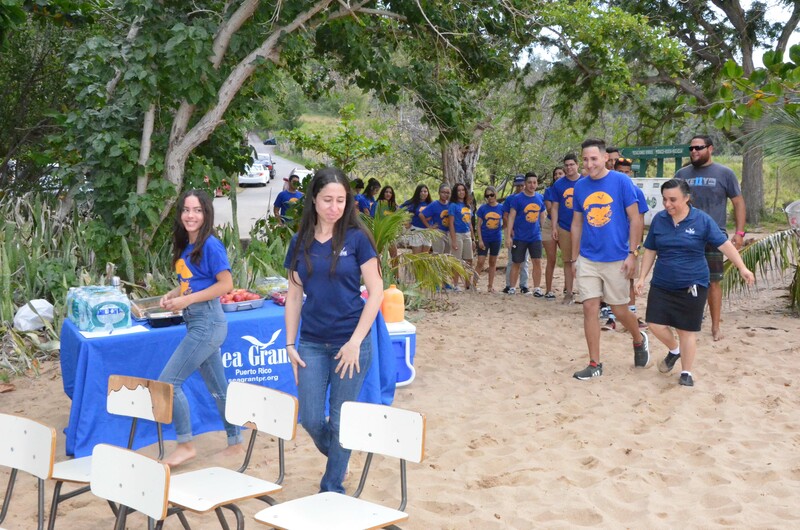 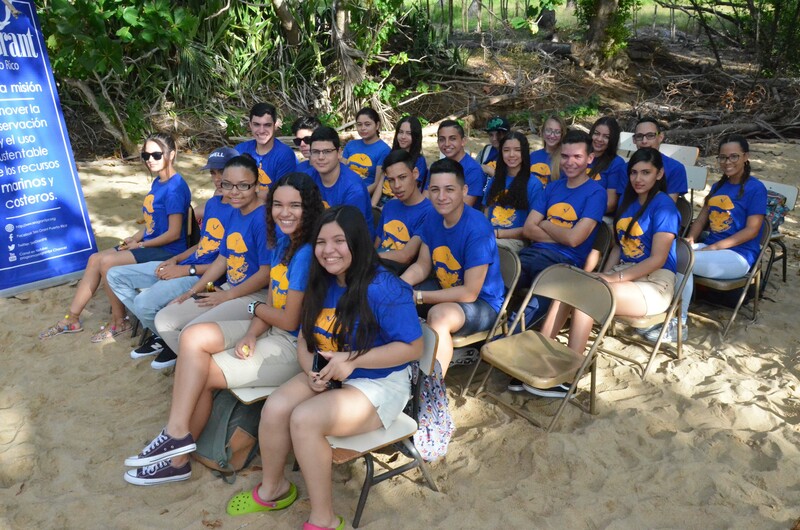 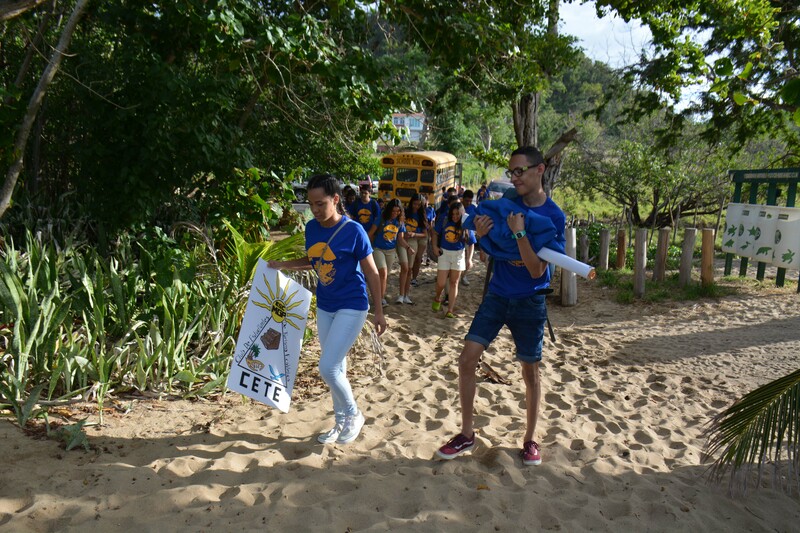 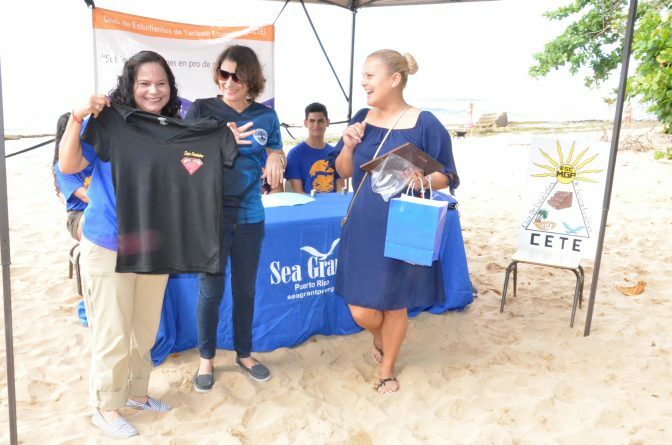 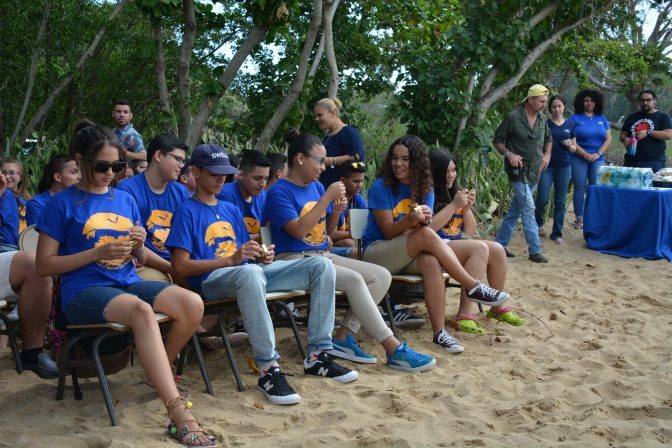 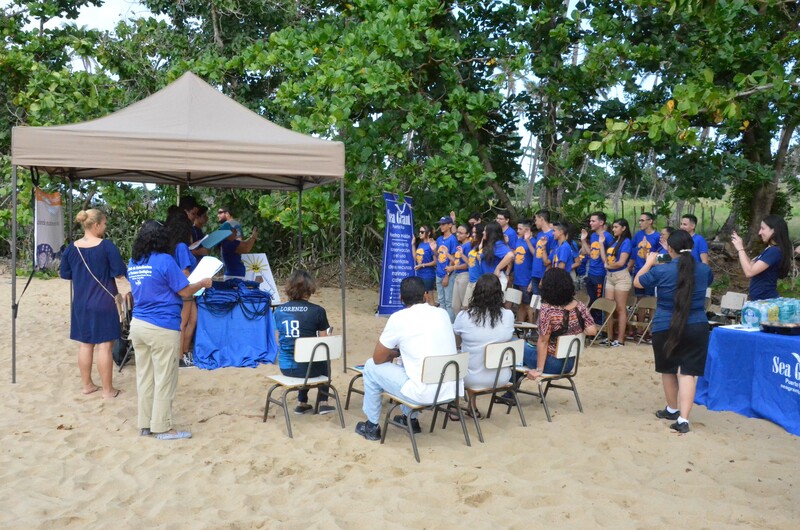 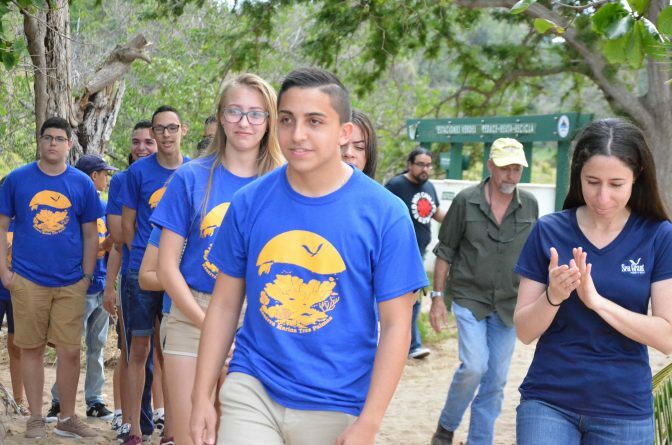 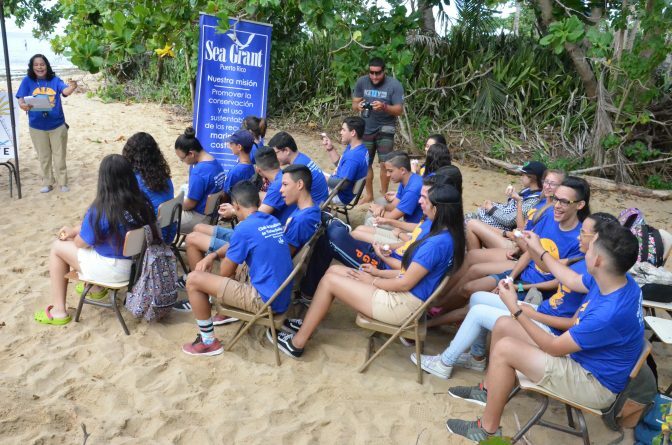 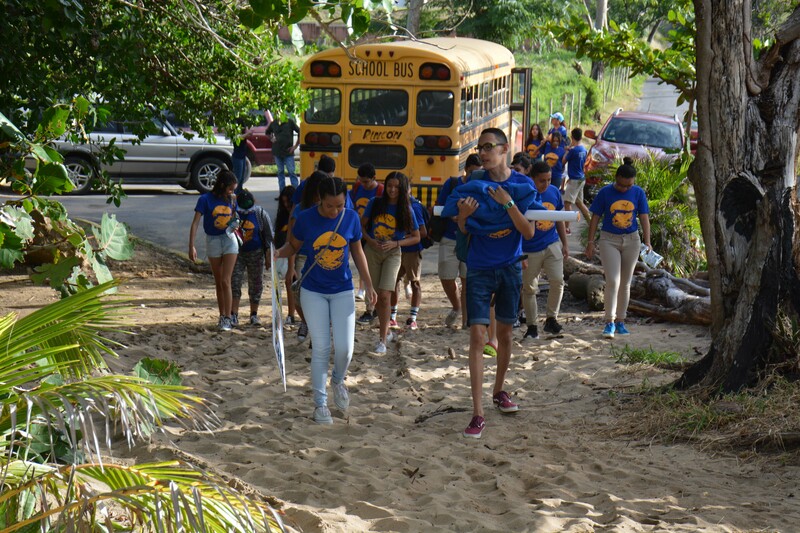 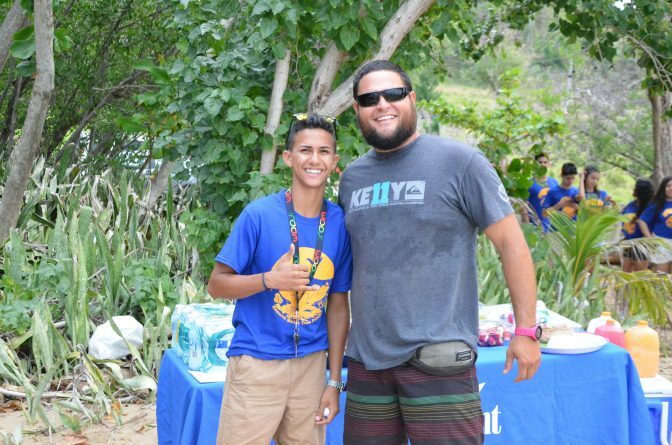 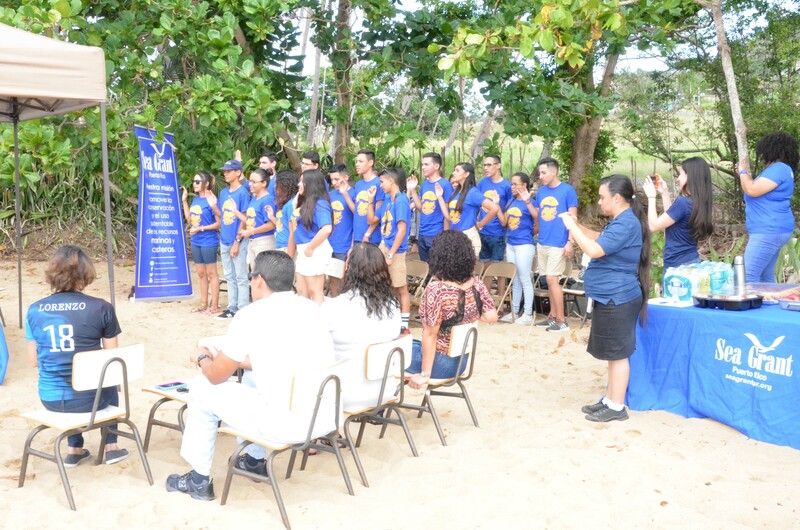 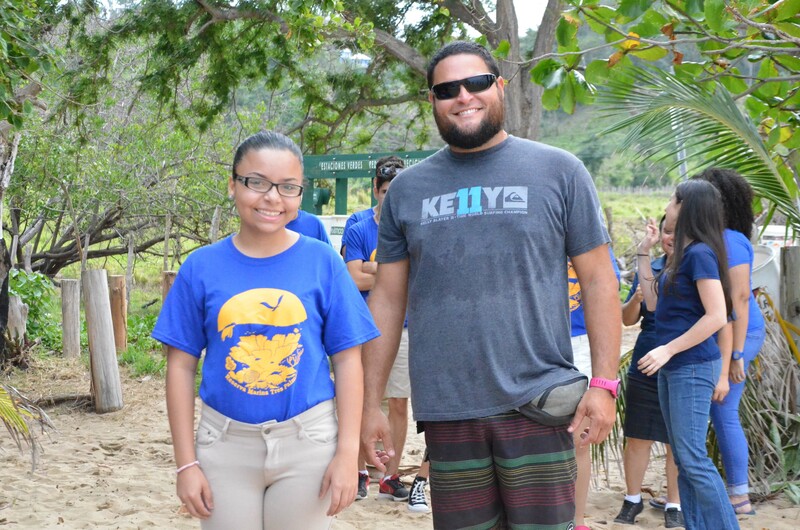 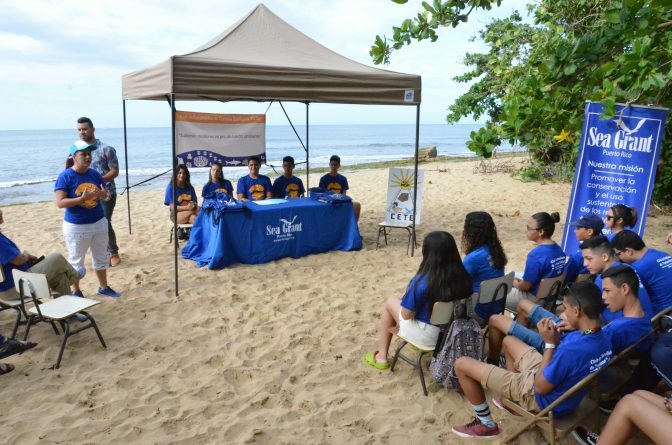 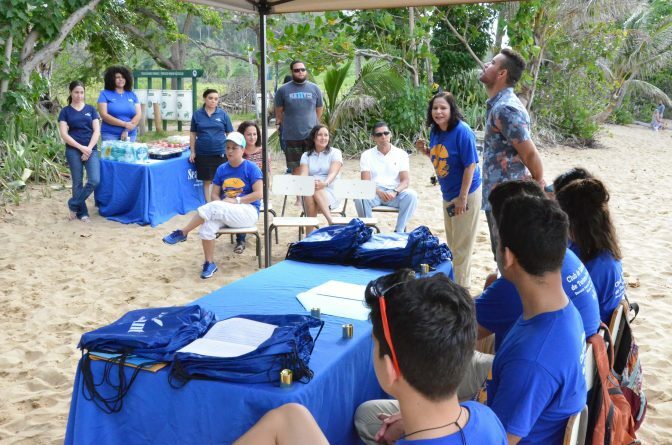 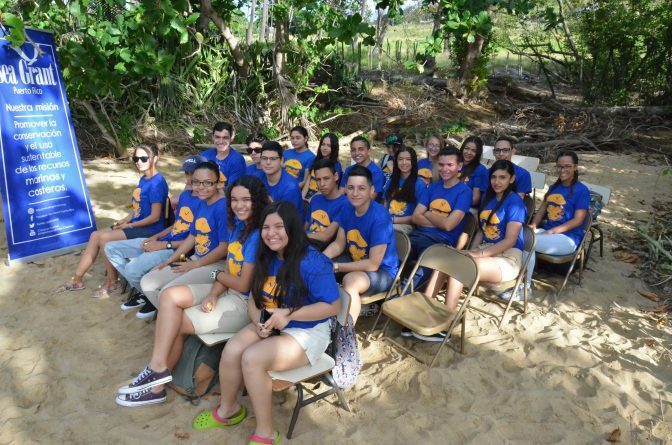 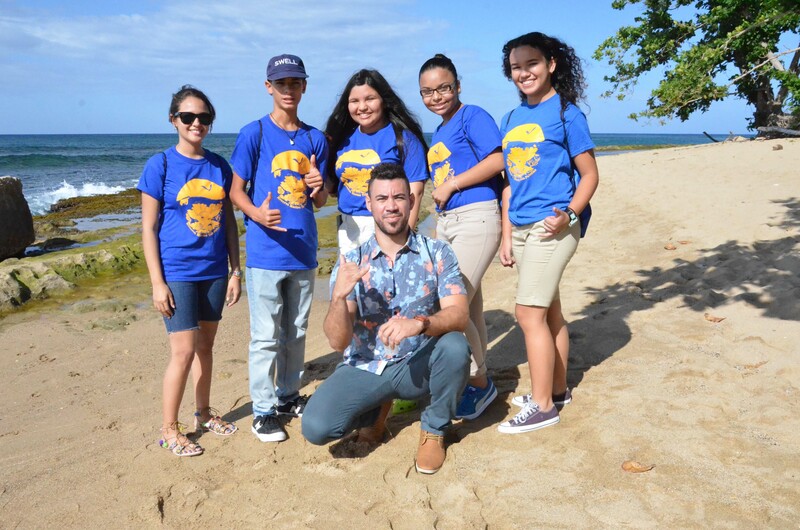 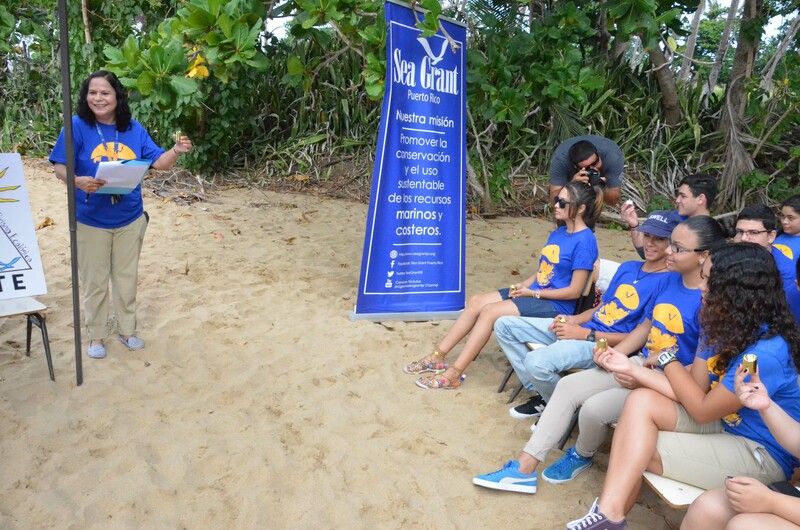 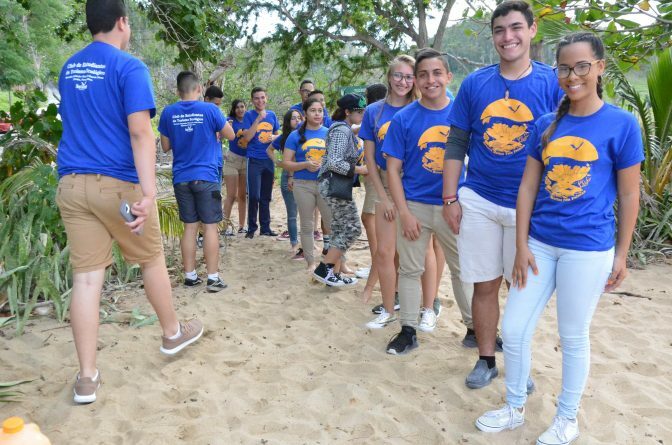 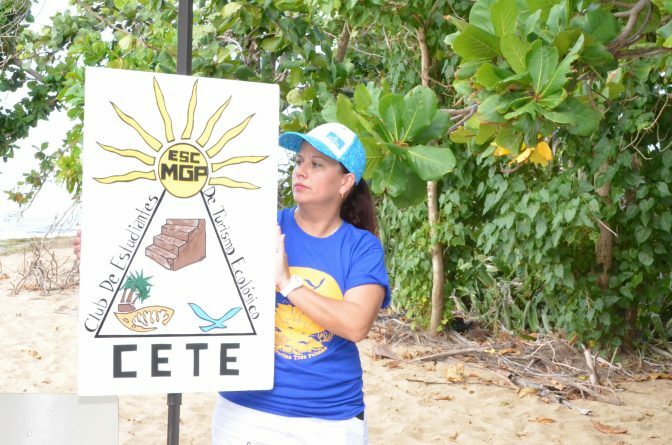 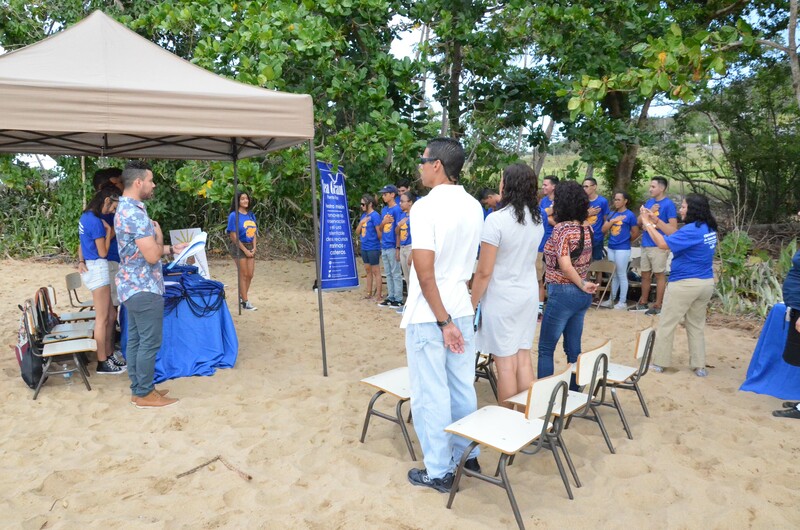 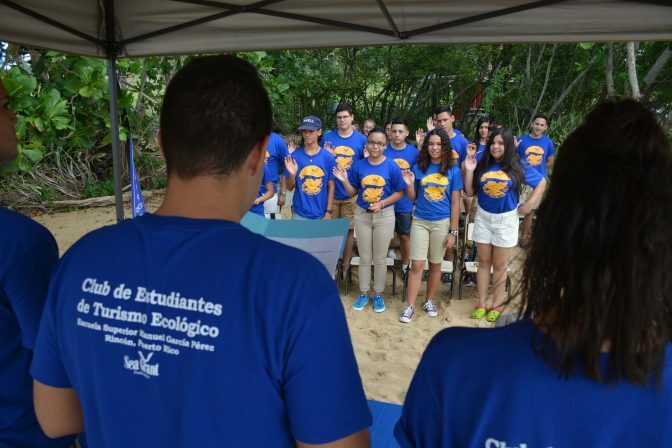 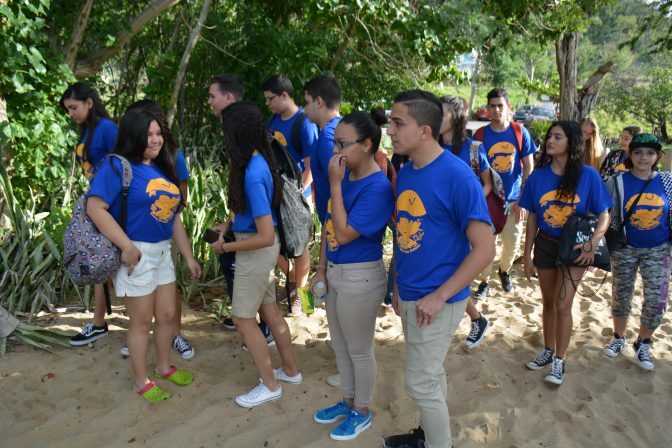 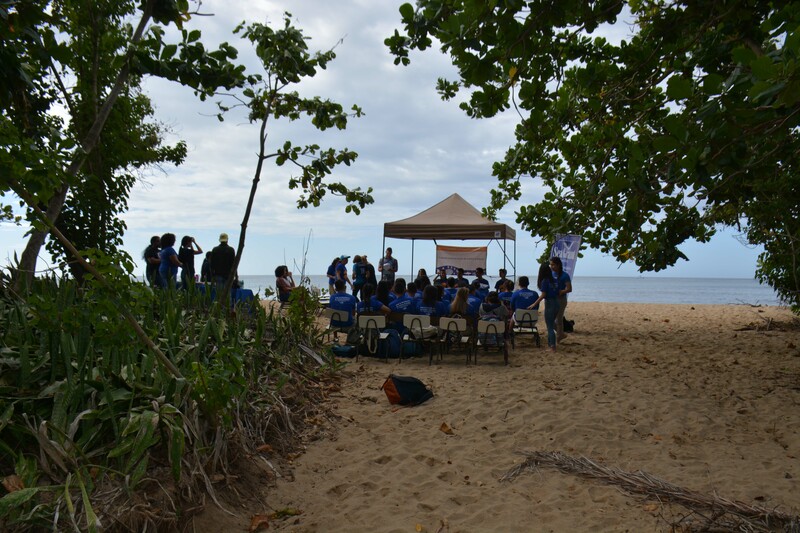 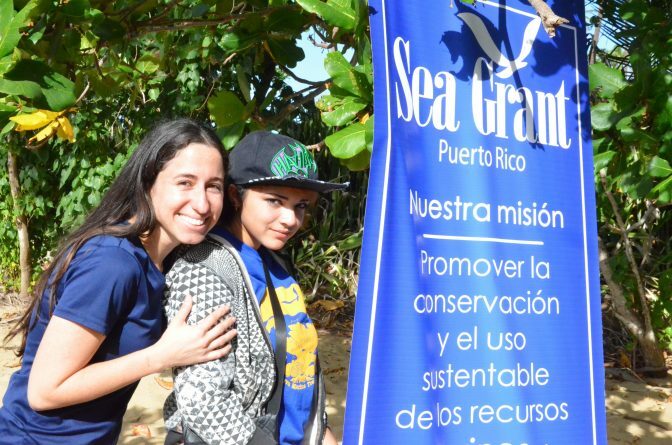 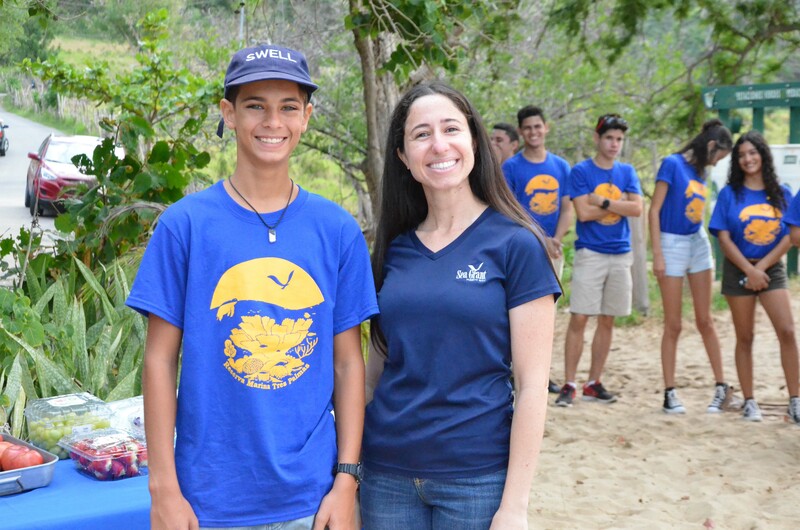 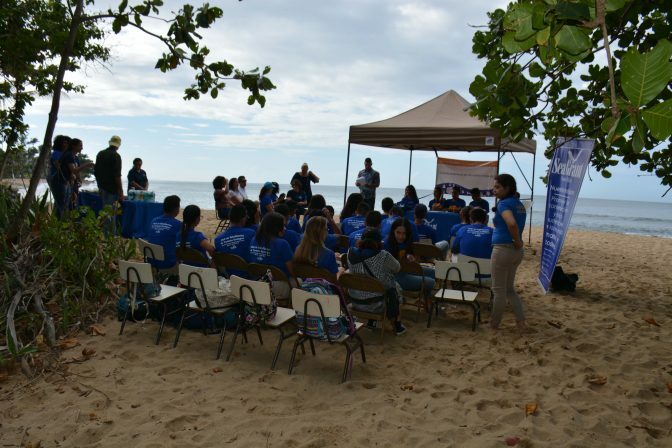 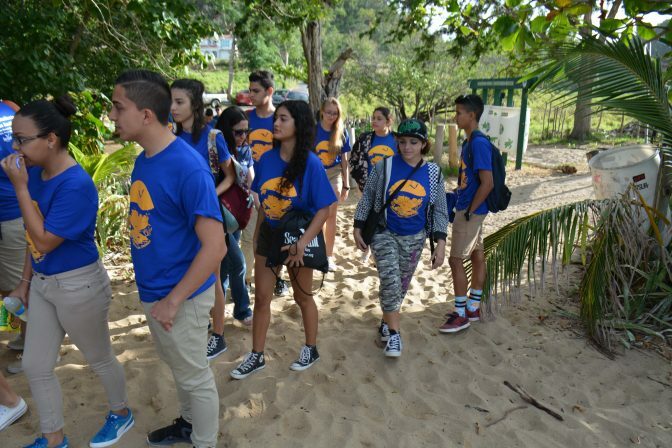 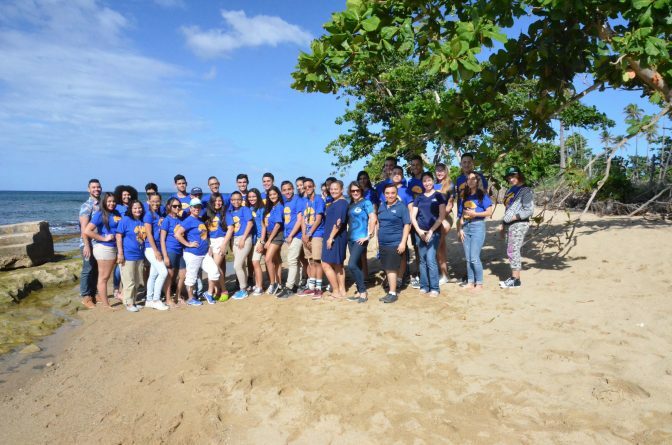 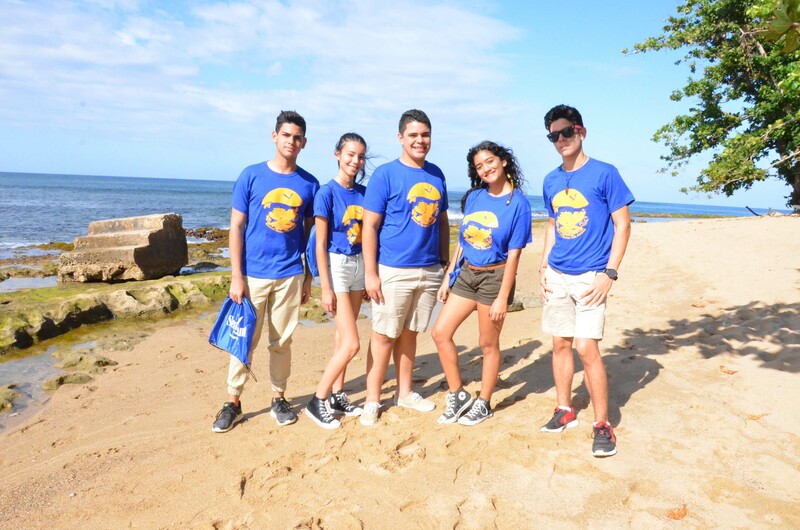 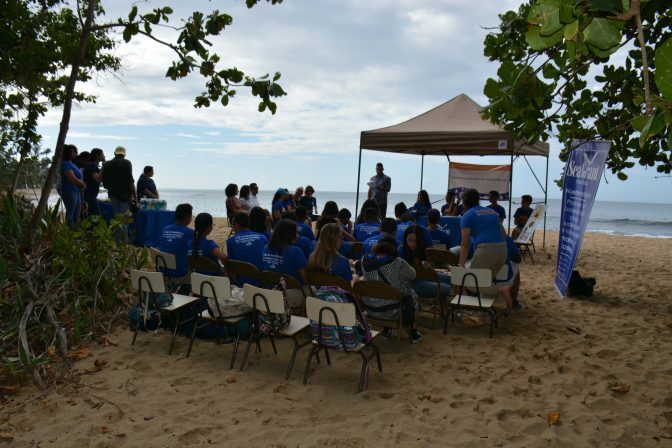 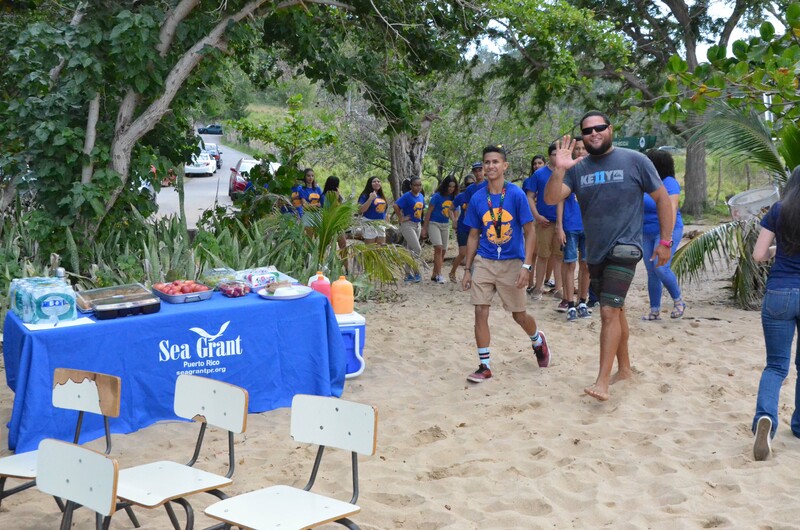 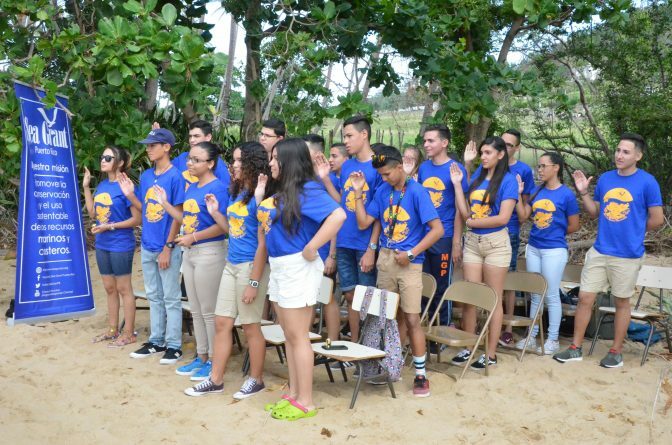 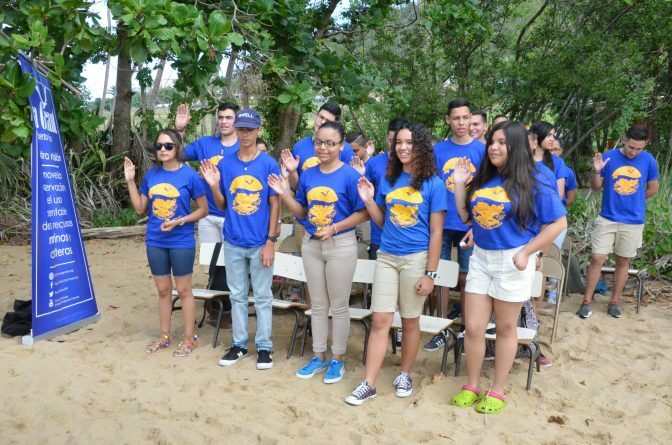 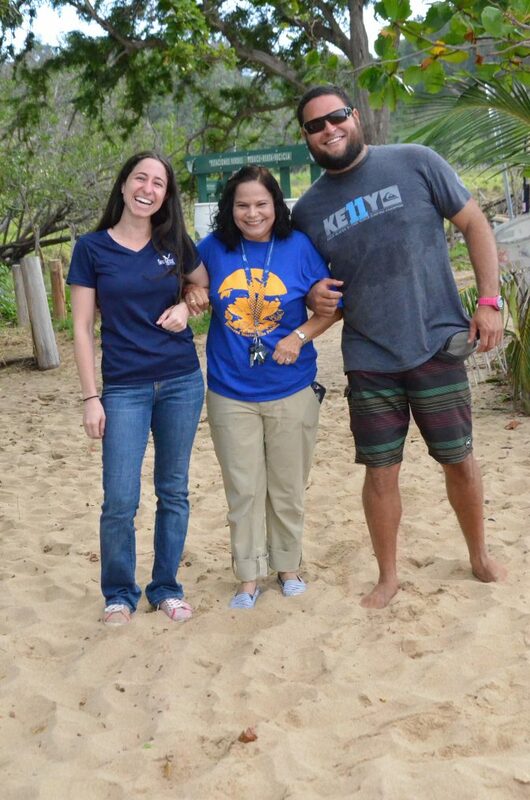 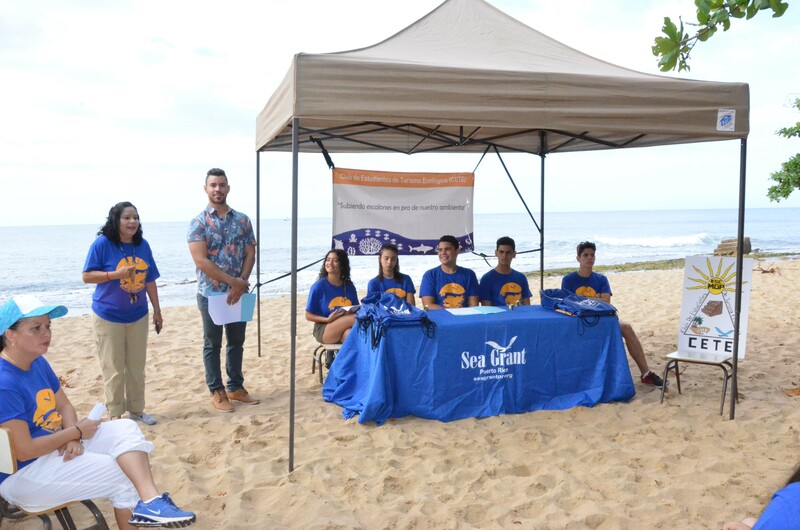 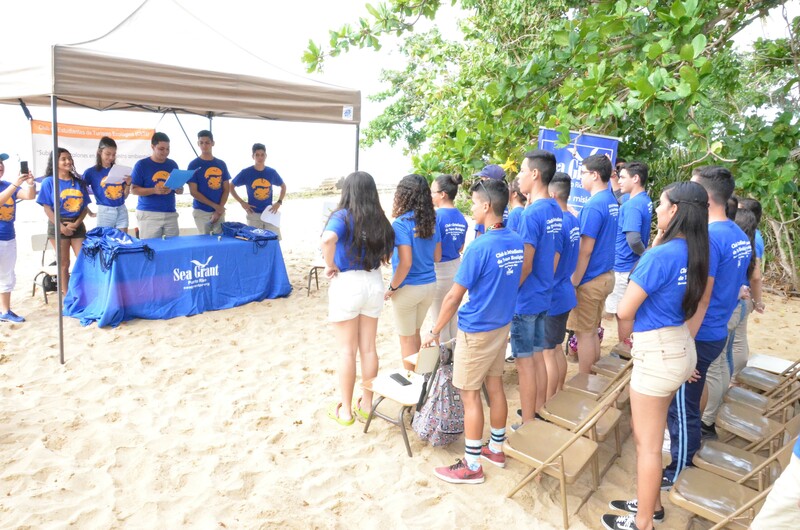 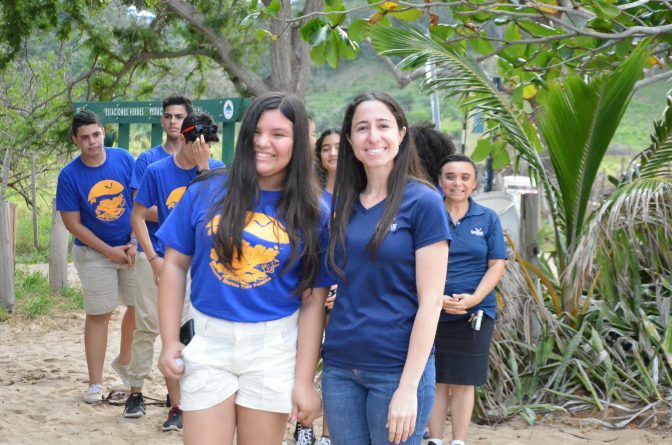 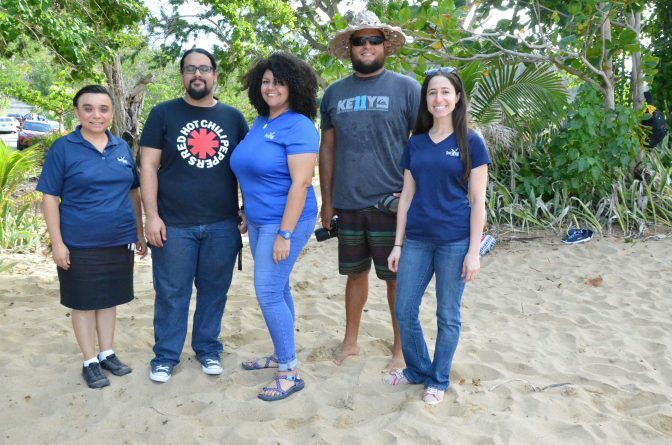 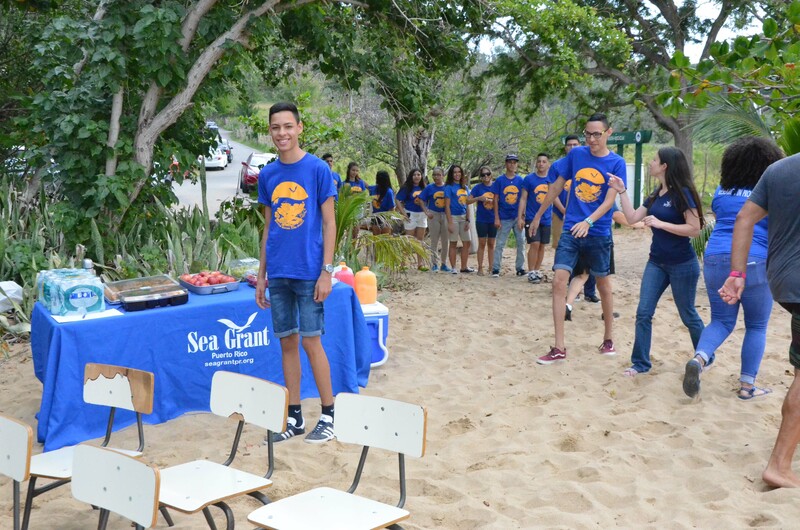 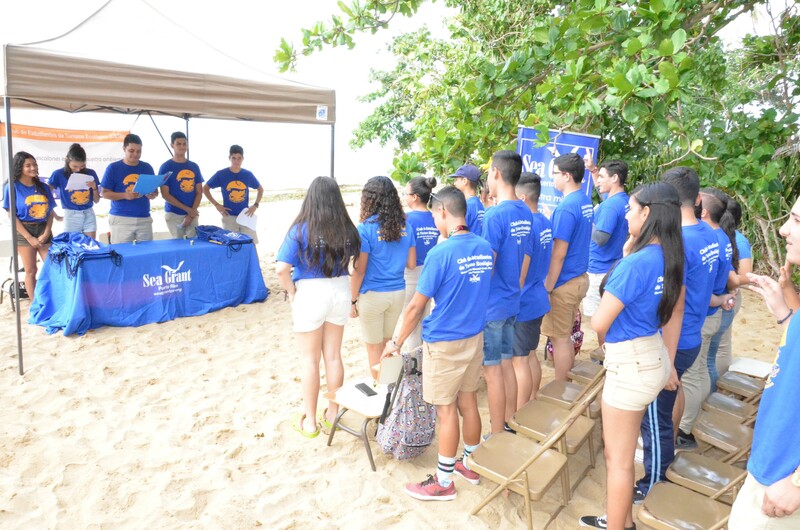 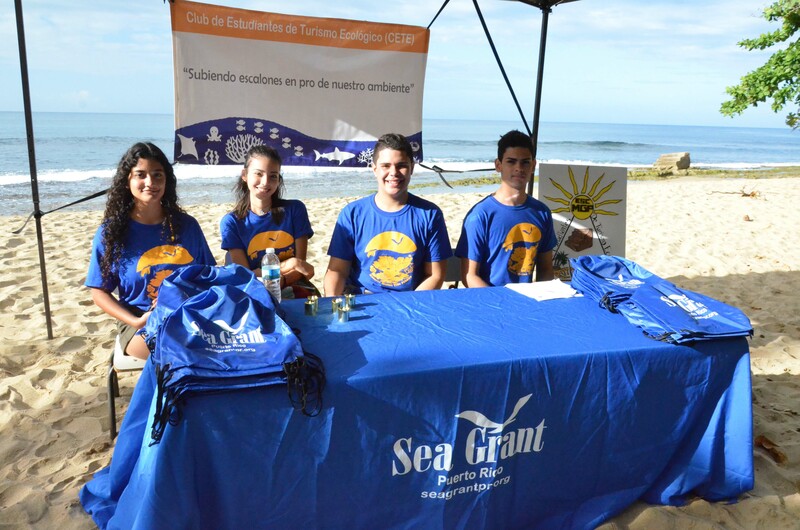 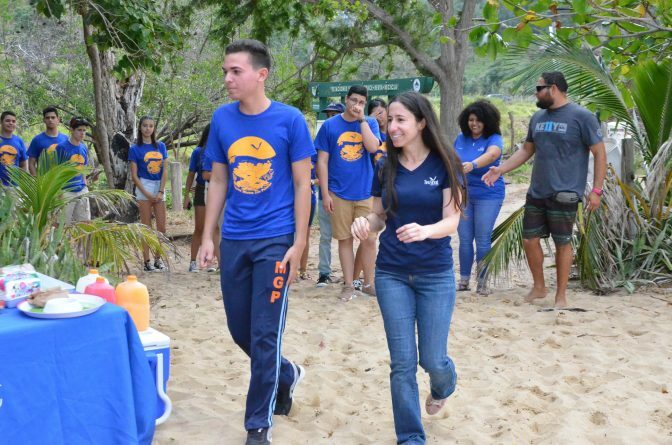 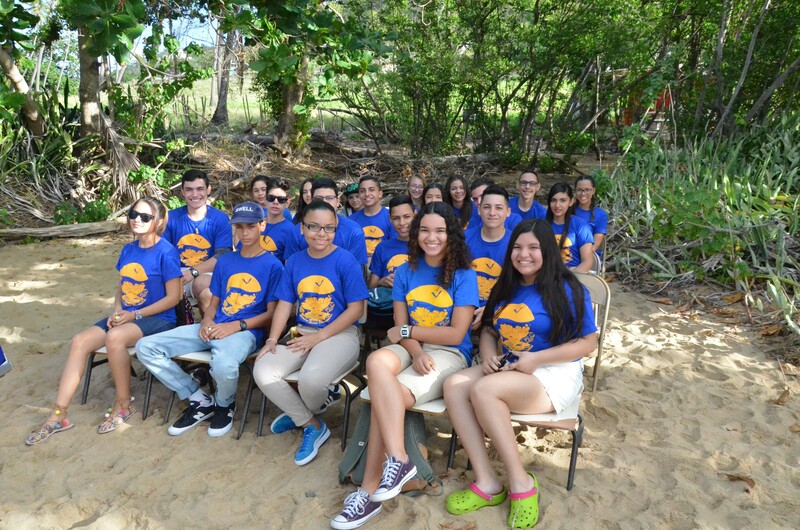 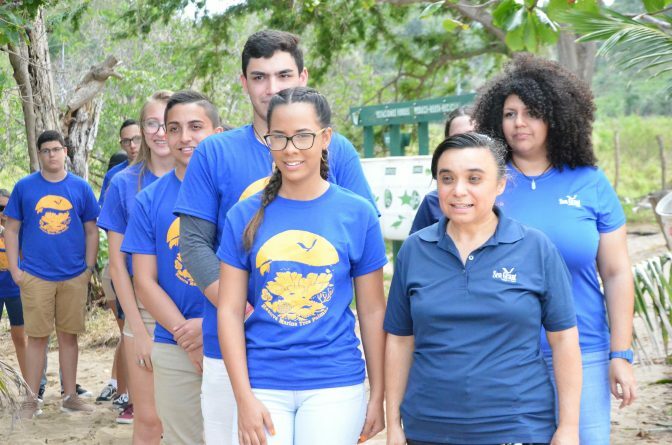 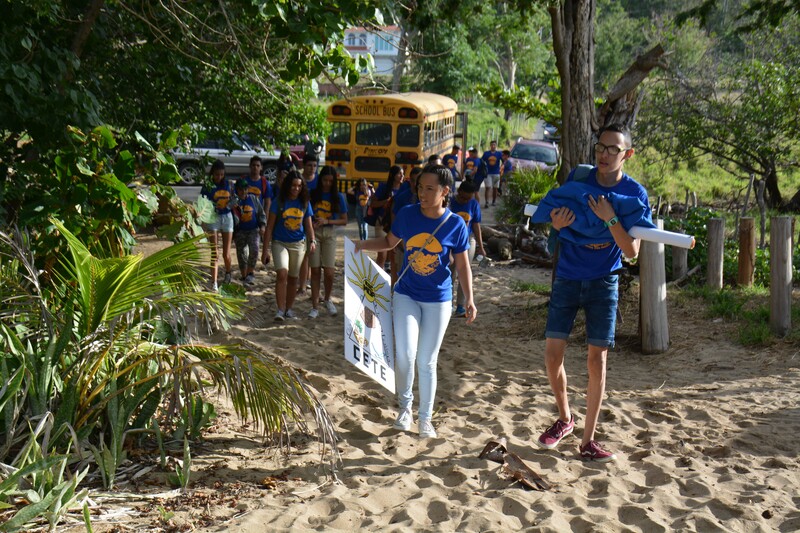 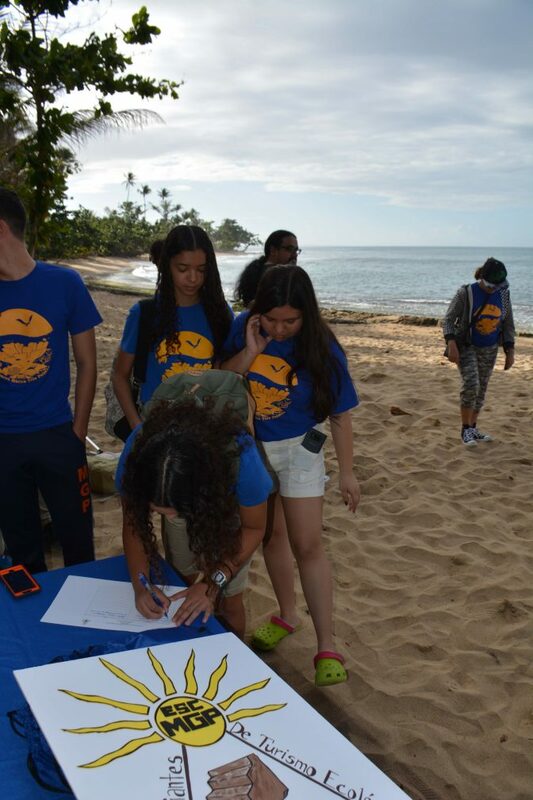 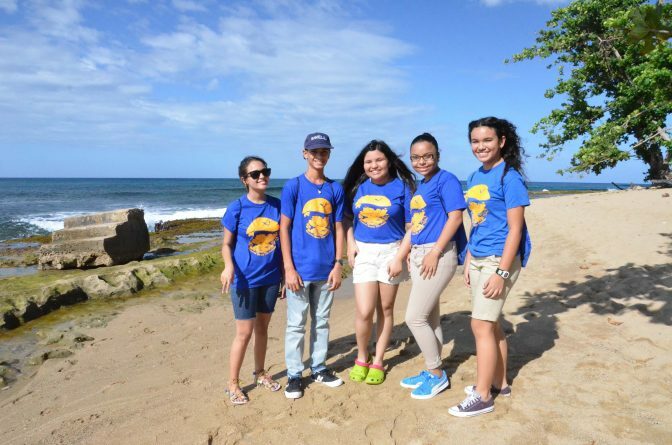 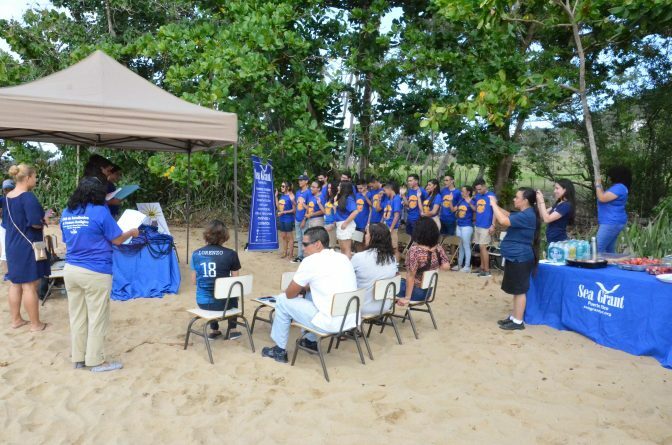 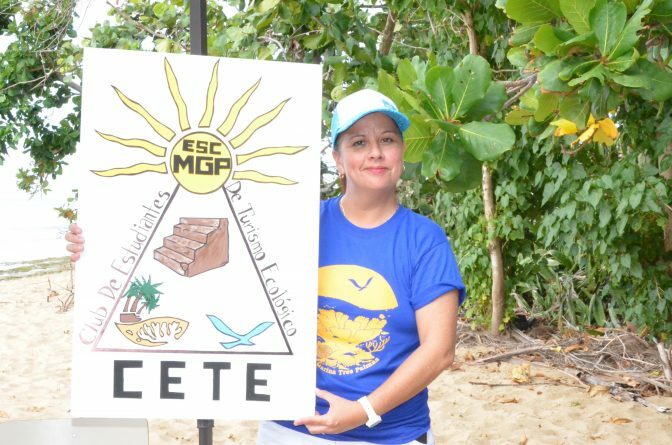 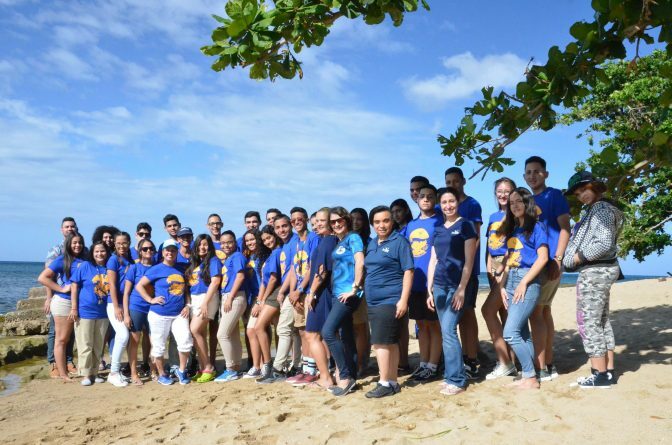 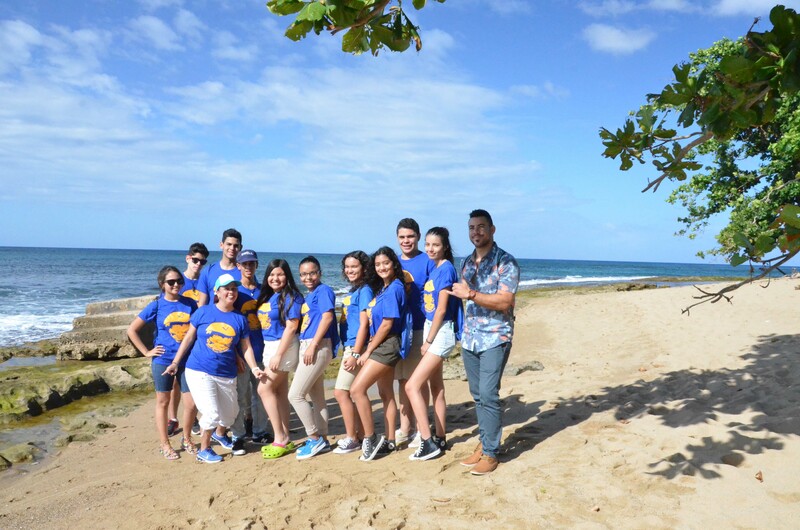 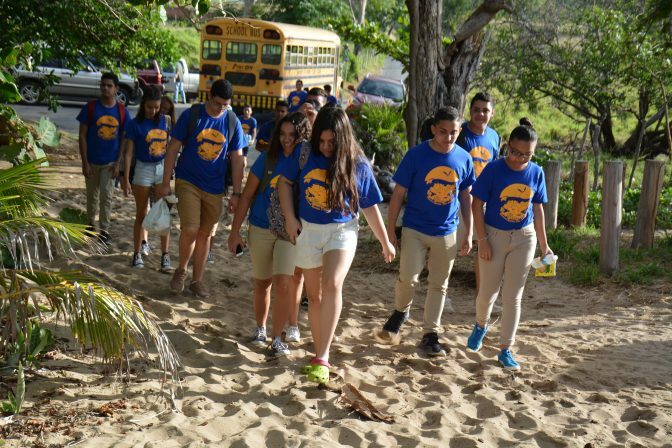 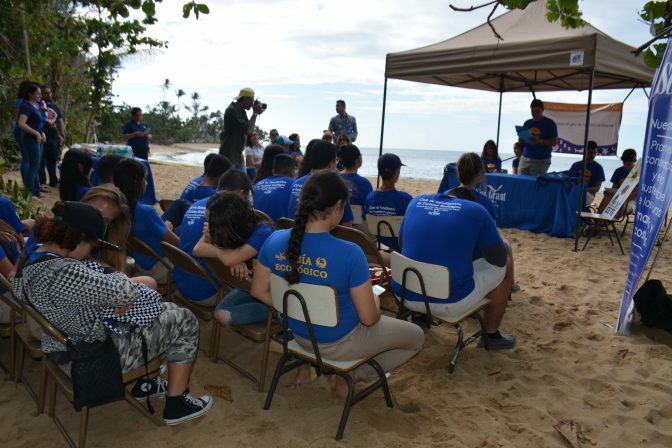 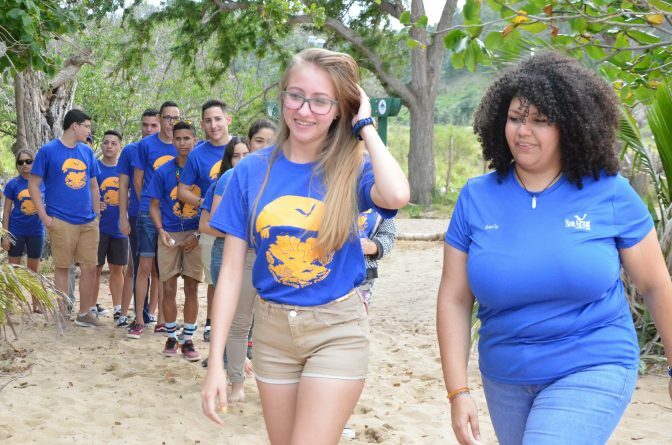 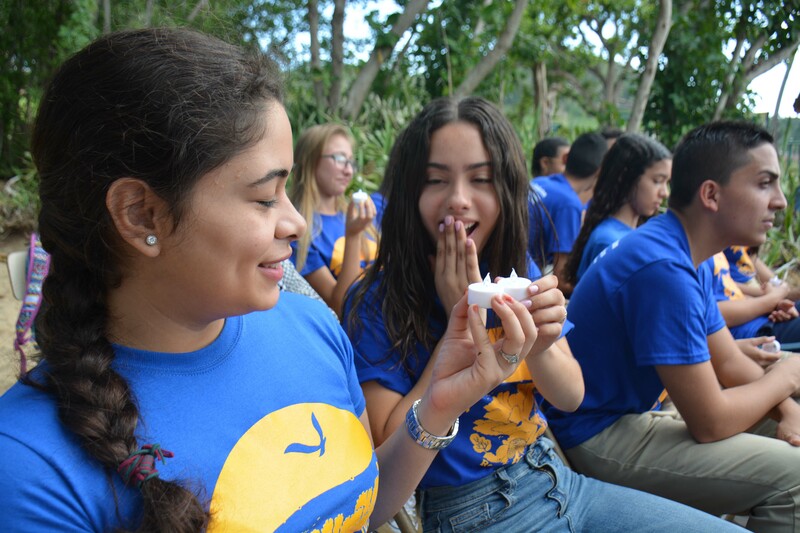 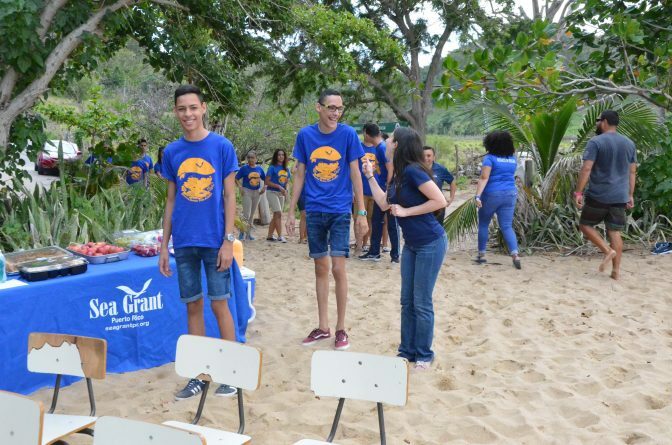 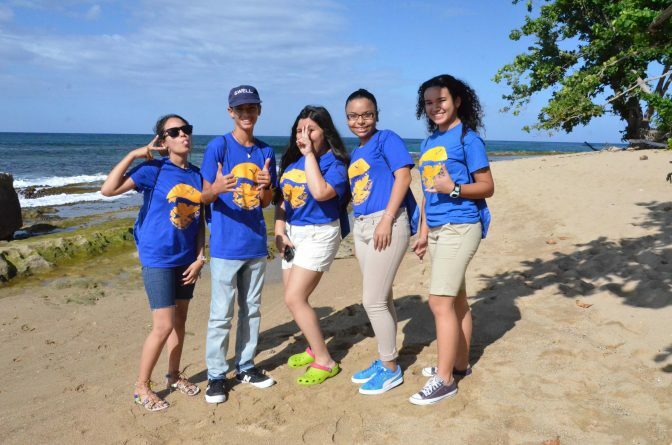 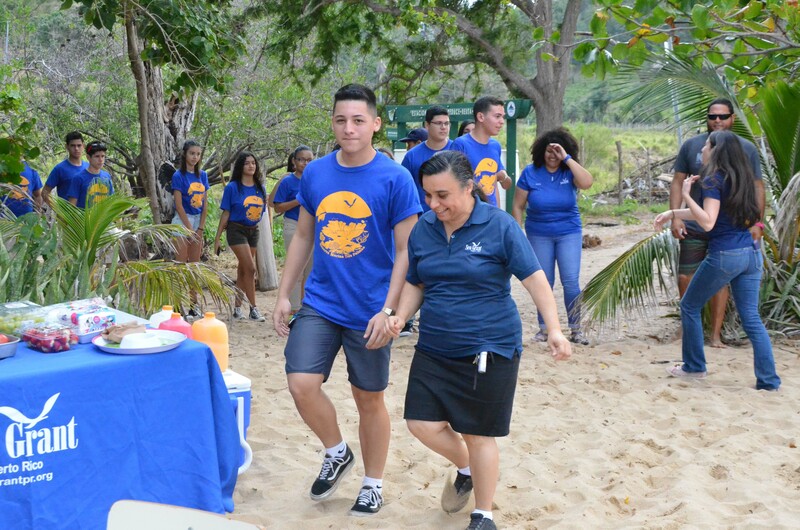 On Thursday, February 8th, 2018, the Manuel García Pérez High School in Rincón, along with the University of Puerto Rico Sea Grant Program, performed the second initiation for the Ecological Tourism Student Club (CETE, by its Spanish acronym) in the Tres Palmas Marine Reserve (specifically, in Steps Beach). 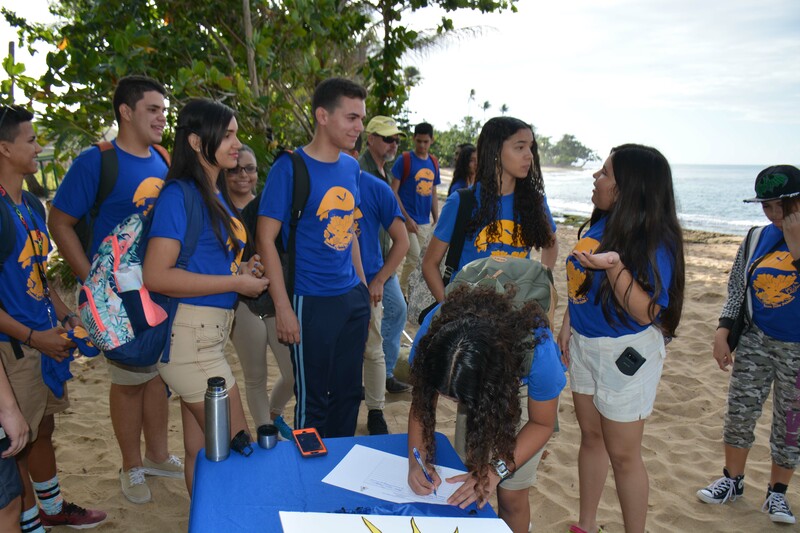 This club was constituted in 2016 by a group of students that felt an urgent need to protect and conserve their community coasts. 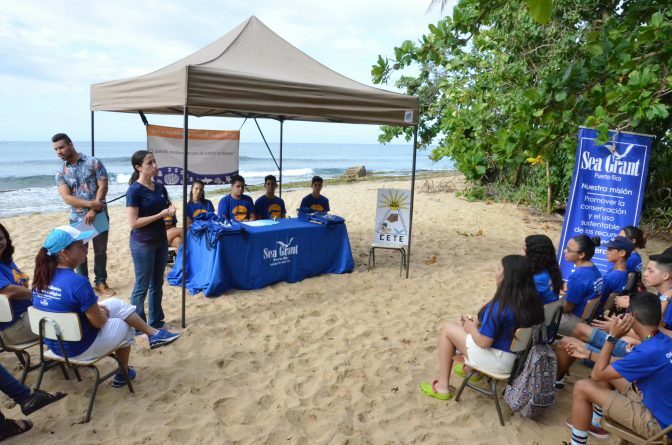 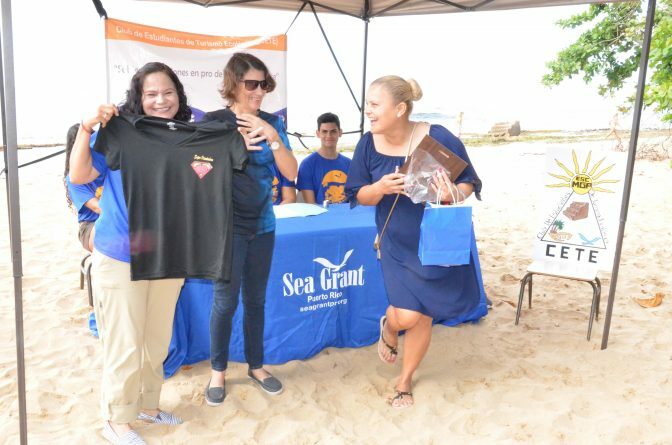 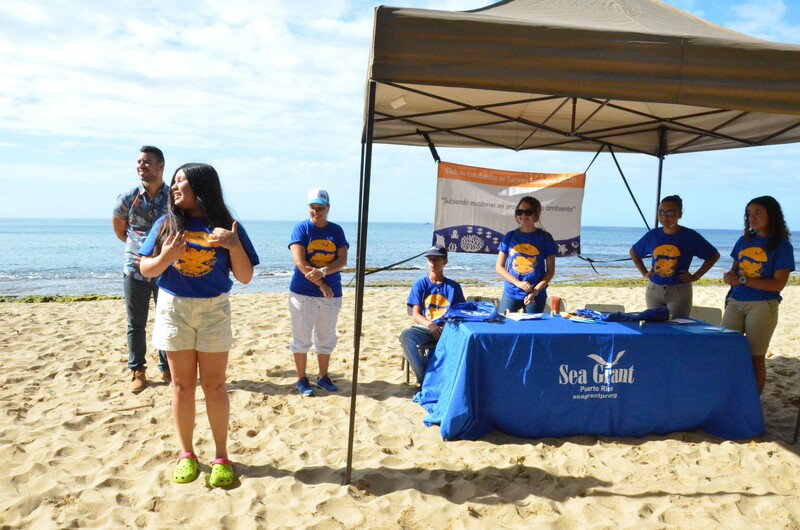 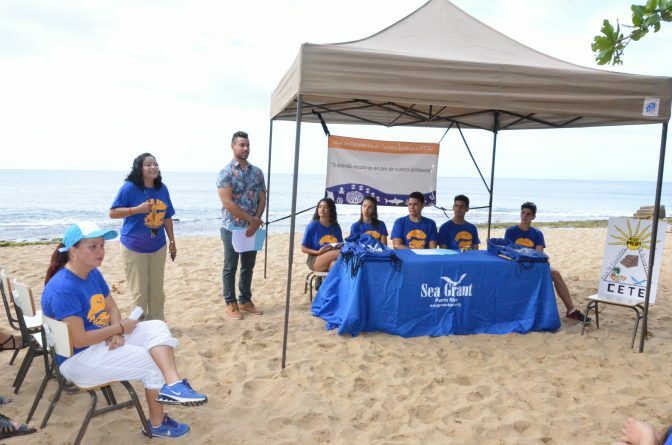 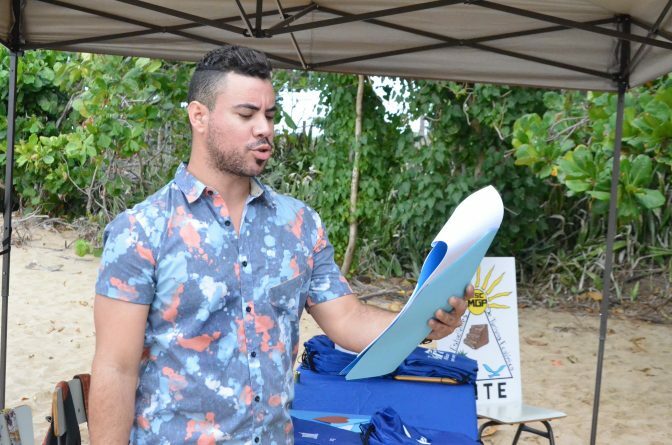 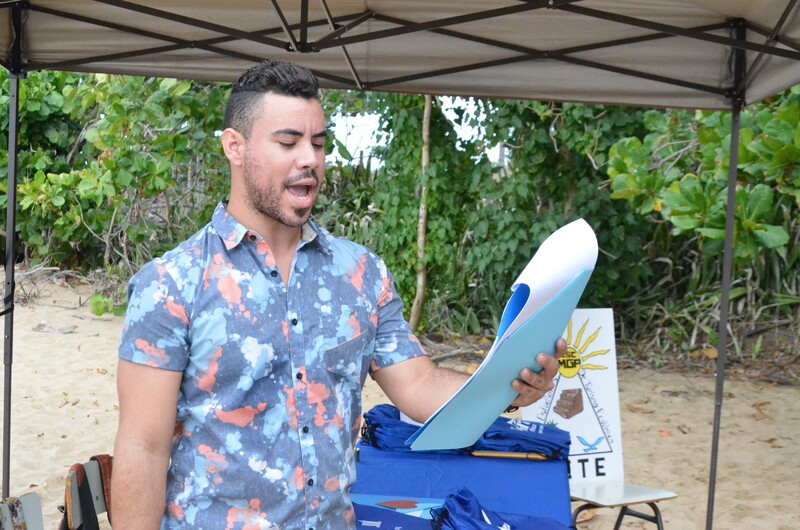 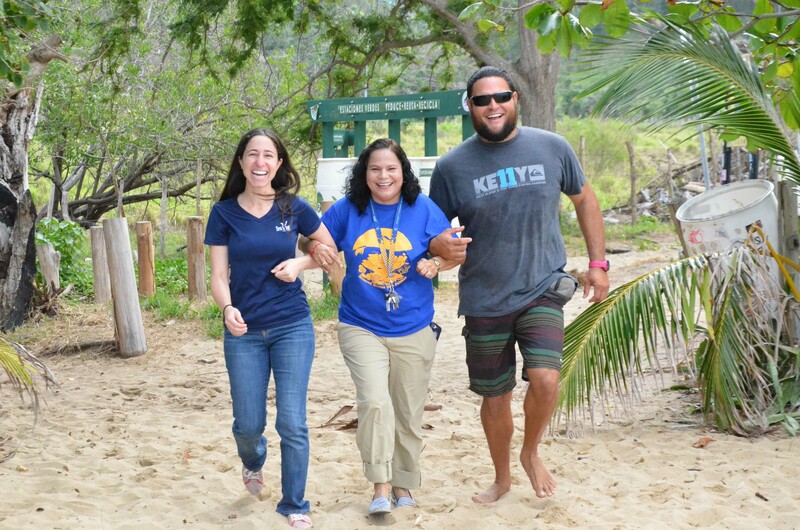 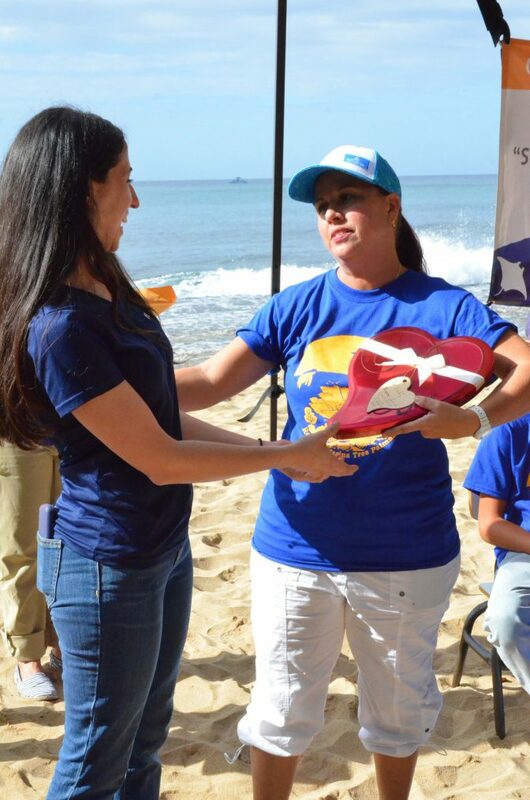 They realized that to help protect their beaches and their marine and coastal resources, it was vital to educate the public about the importance of using them sustainably. 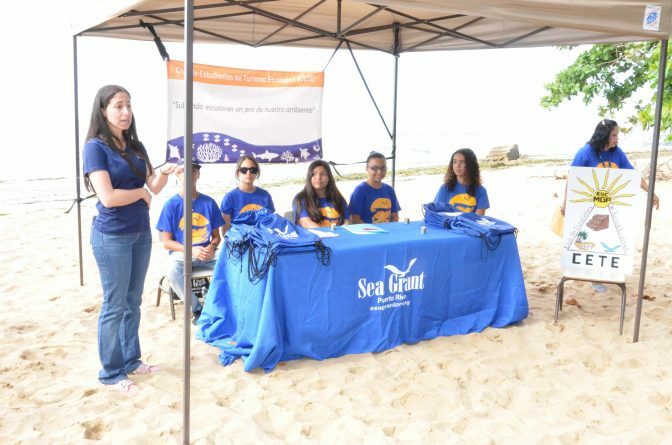 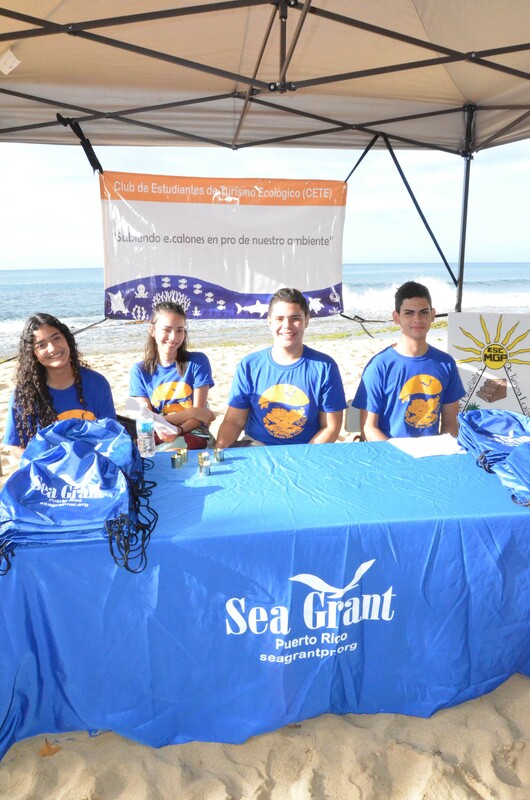 When they started their work, students took several trainings sponsored by the Sea Grant Program. They received workshops about beach composition, marine mammals, marine ecosystems, sea turtles and environmental interpretation, among other topics. They were also trained so they could perform activities and measurements as part of the Sandwatch Project. These students not only educate their community but take direct action for their environment. 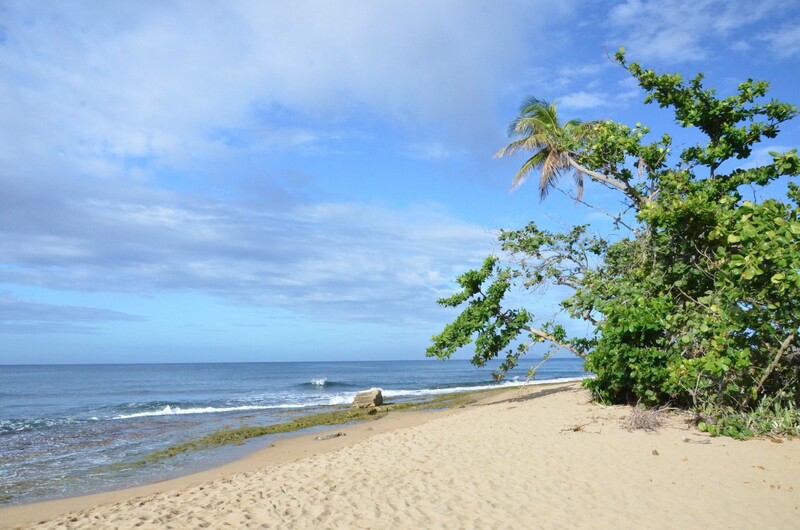 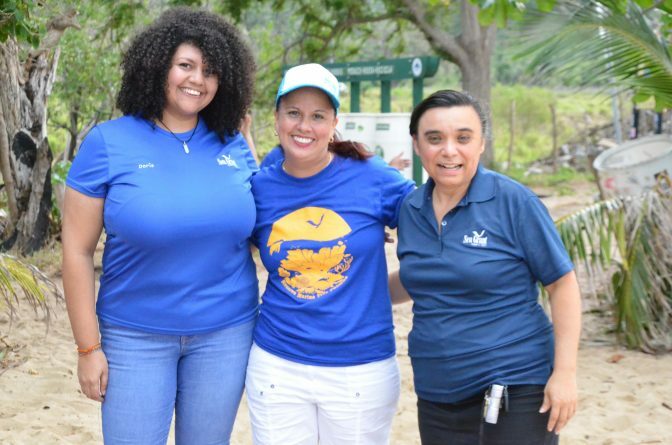 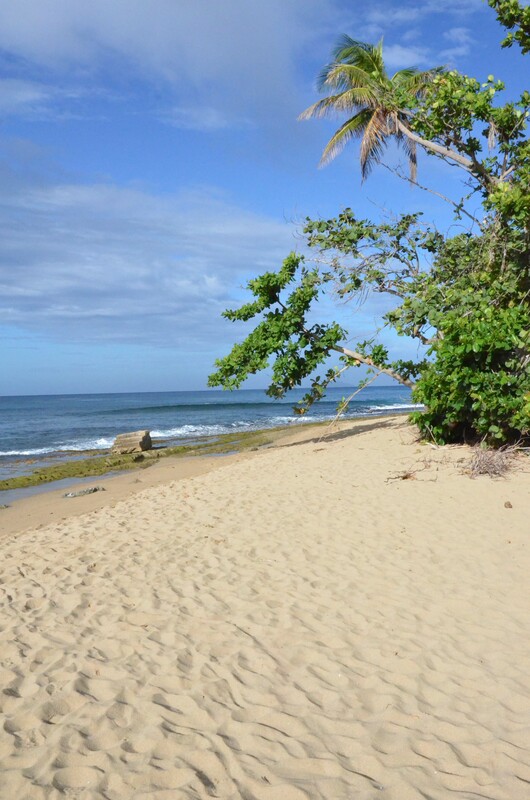 They have adopted the Tres Palmas Marine Reserve in Rincón, where they clean the beach, measure its profile, analyze water quality and sand composition, and other activities. 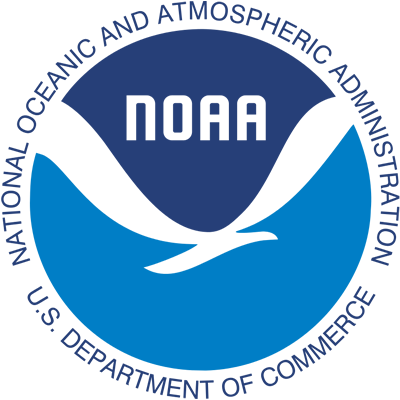 They also participate in open house events in which they inform their community about the benefits of preserving these valuable resources. 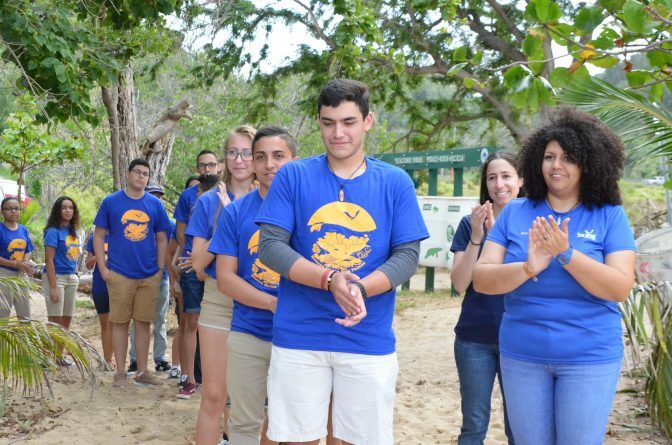 These same students took it upon themselves to provide continuity to their work and, before graduating from high school, they recruited students who were as involved and dedicated to nature and their environment as they themselves are. 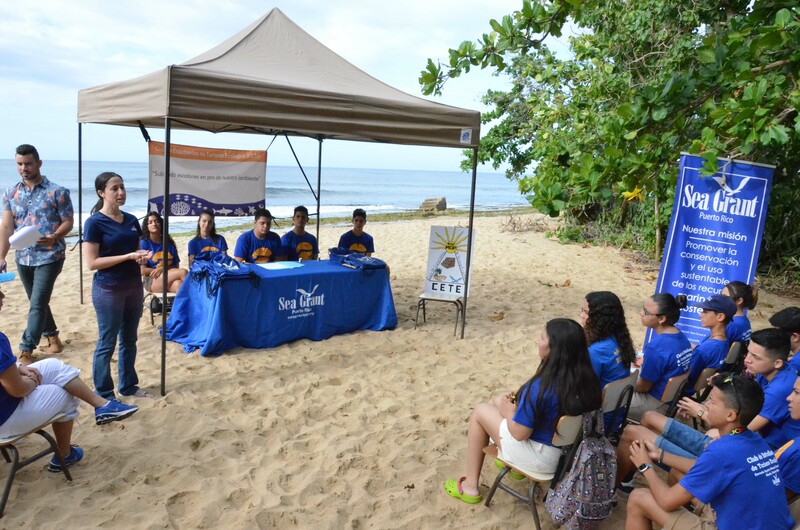 They were aided in this by their teachers, Profs. 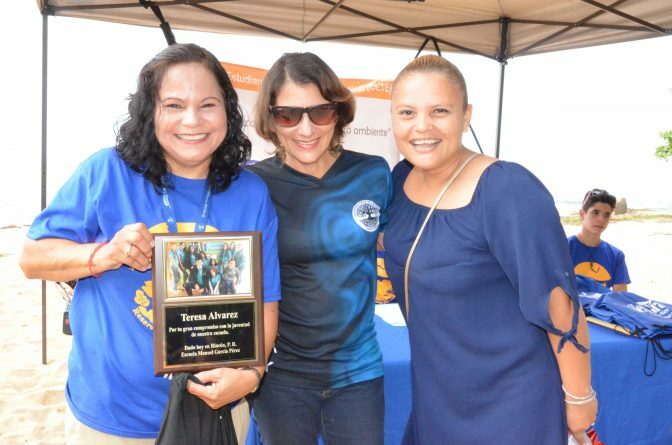 Teresa Álvarez and Vivian Otero, and advised by Berliz Morales. 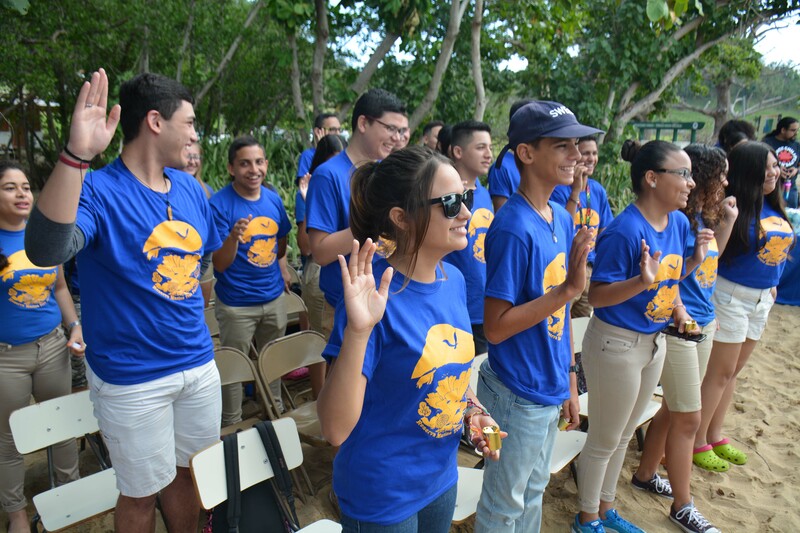 On February 8th, the baton was passed to 26 students, who were excited to undertake their predecessors’ work and continue this labor of love. 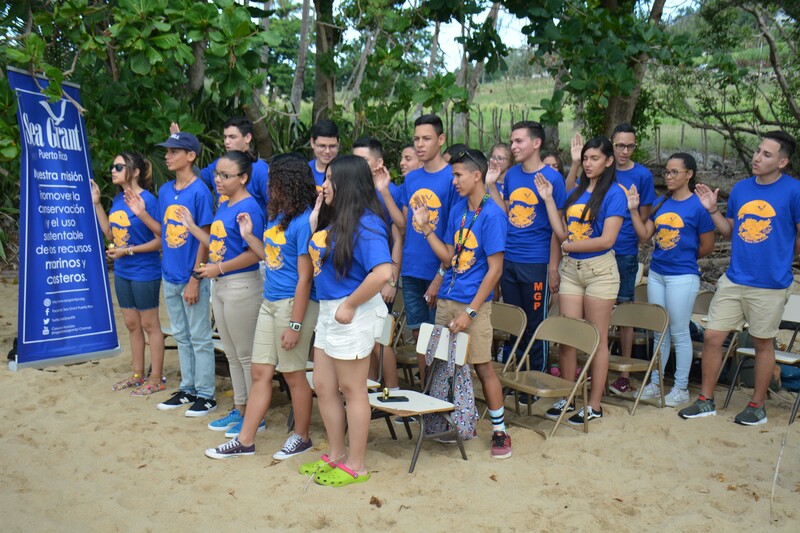 The previous board, along with its leaders, initiated the new members and led the transition into the new board. The enthusiasm was clear in the young people who undertook their new charge with all the seriousness befitting the task. 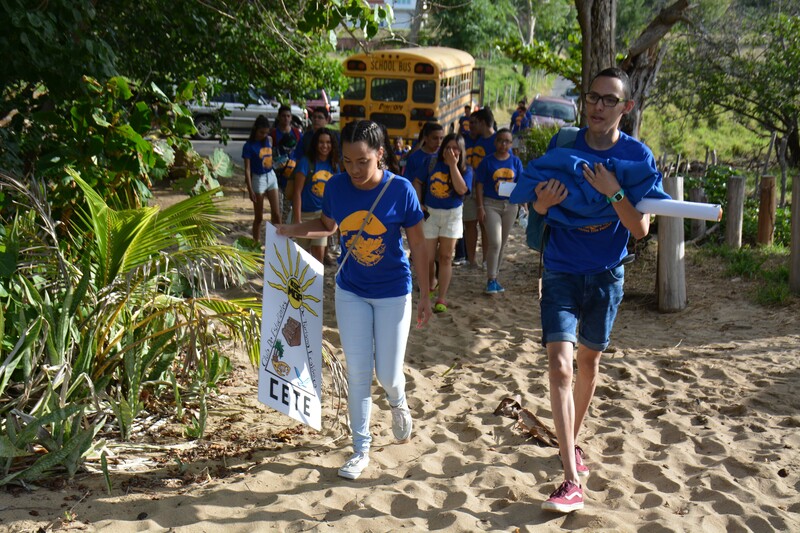 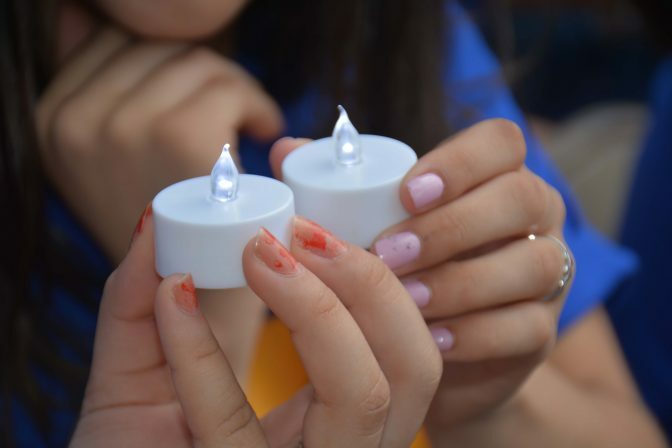 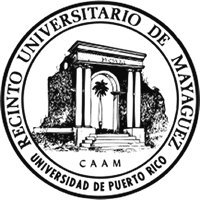 This initiative caused the CETE Club to form in several other public and private schools in Puerto Rico. This is a great achievement since more and more people are joining this effort. 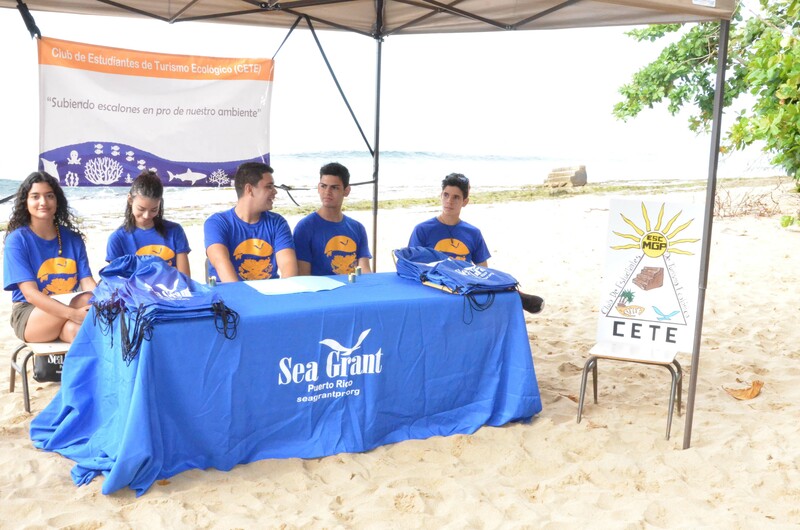 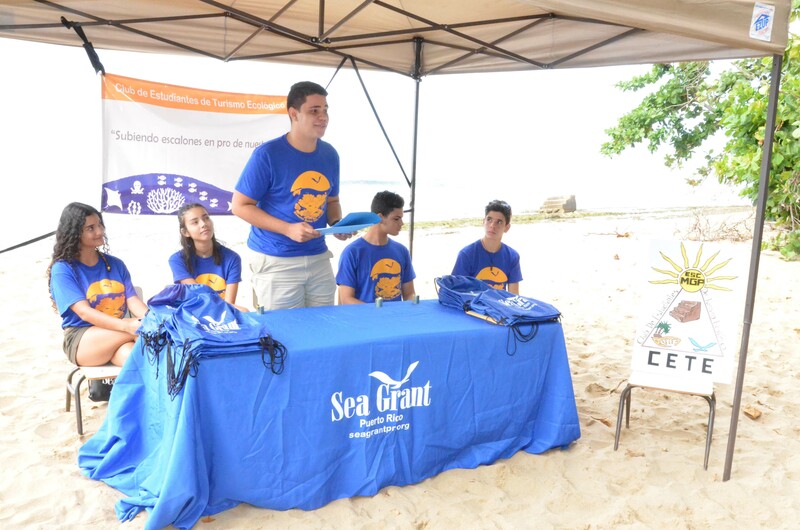 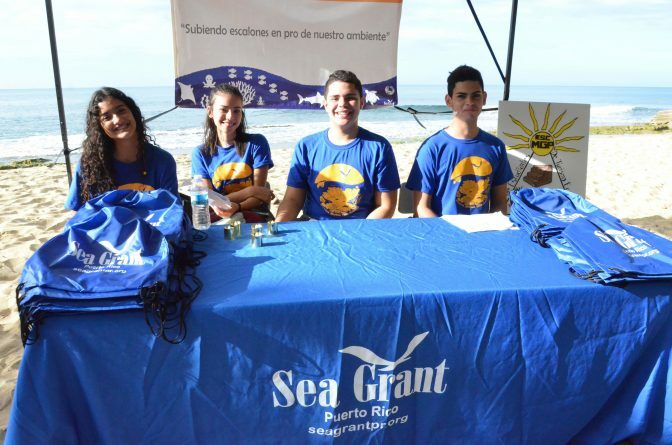 The Sea Grant Program is very proud of these youths and reiterates its commitment to education, to the conservation of our marine and coastal resources, and to the development of our young people.